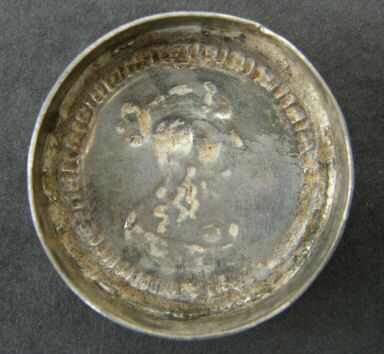 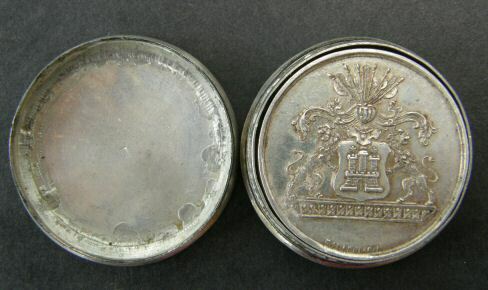 By Simon van de Passe, circa 1630, with the image of a monarch, length of reign, burial place and coat of arms, contained in a contemporary silver counter box also from the van der Passe workshop. 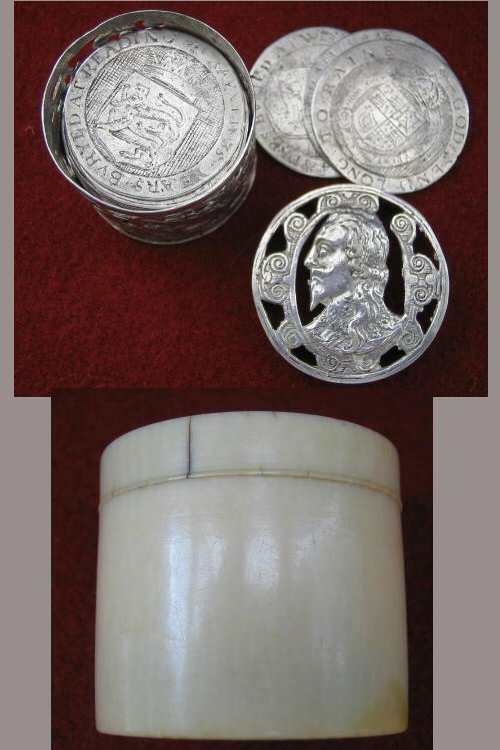 The cover pierced with a portrait of Charles I, the sides with mythical beasts and the base with Queen Henrietta Maria. 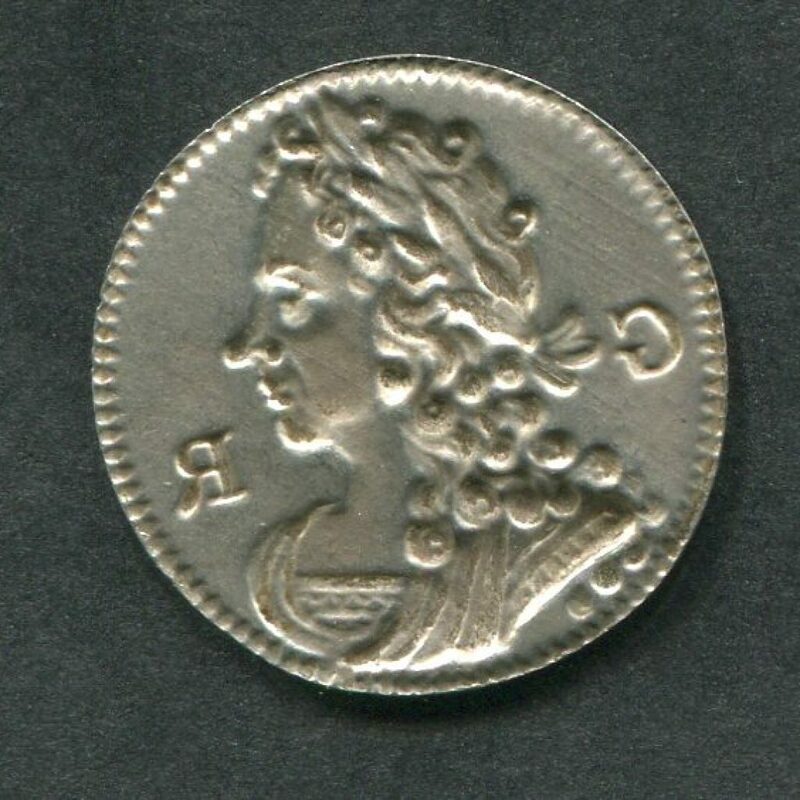 The counters commences with Edward the Confessor and end with Prince Charles [ later Charles II ]. 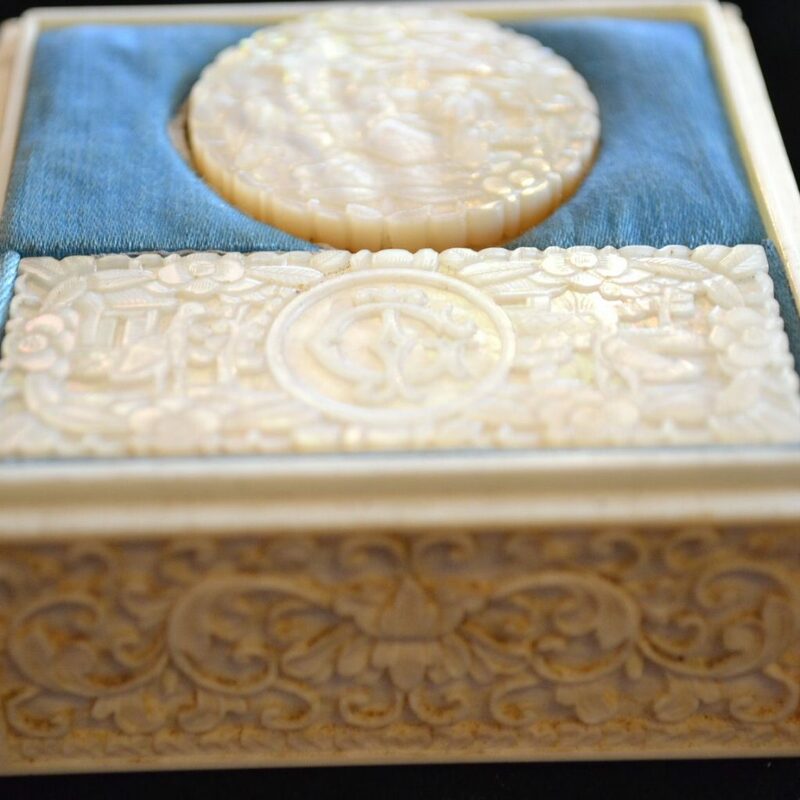 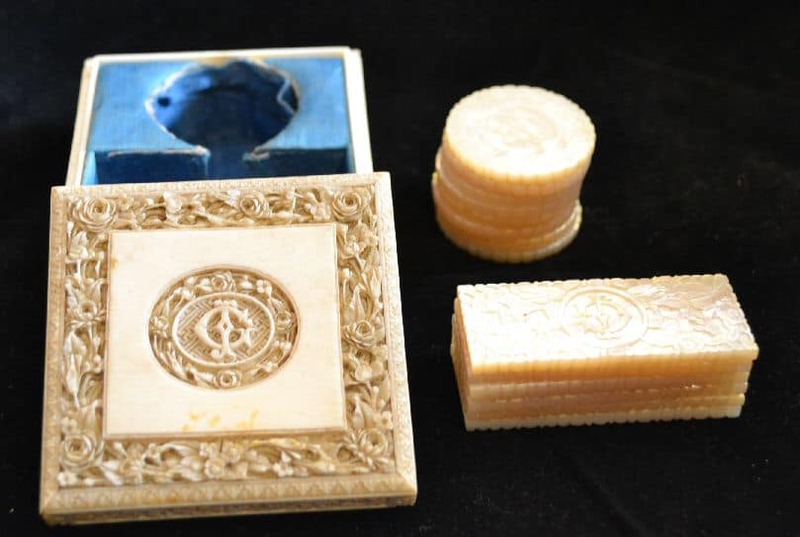 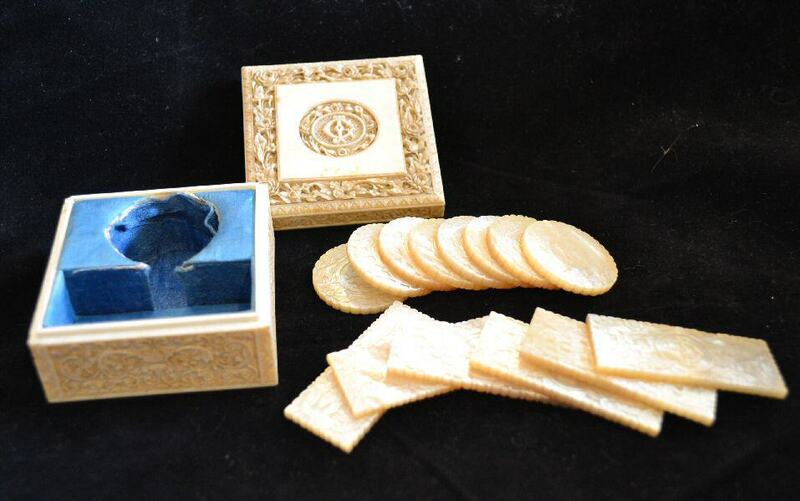 The entire box is housed in a turned ivory box, diameter 2.6cm. 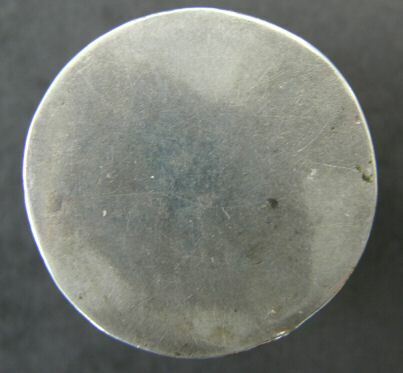 I GIVE NO OPINION ON THE CONDITION ON THE COUNTERS AS I FIND THE SUBJECT SO SUBJECTIVE – THE PICTURES SHOULD SHOW ALL THE DEFECTS AS THEY HAVE BEEN SCANED AT 600dpi BUT SINCE THESE ARE CAST THEY ARE FULL OF NATURAL IMPERFECTIONS EVEN THOUGH THERE WERE SOME ATTEMPTS BY THE CRAFTSMEN TO TIDY UP THE COUNTERS. 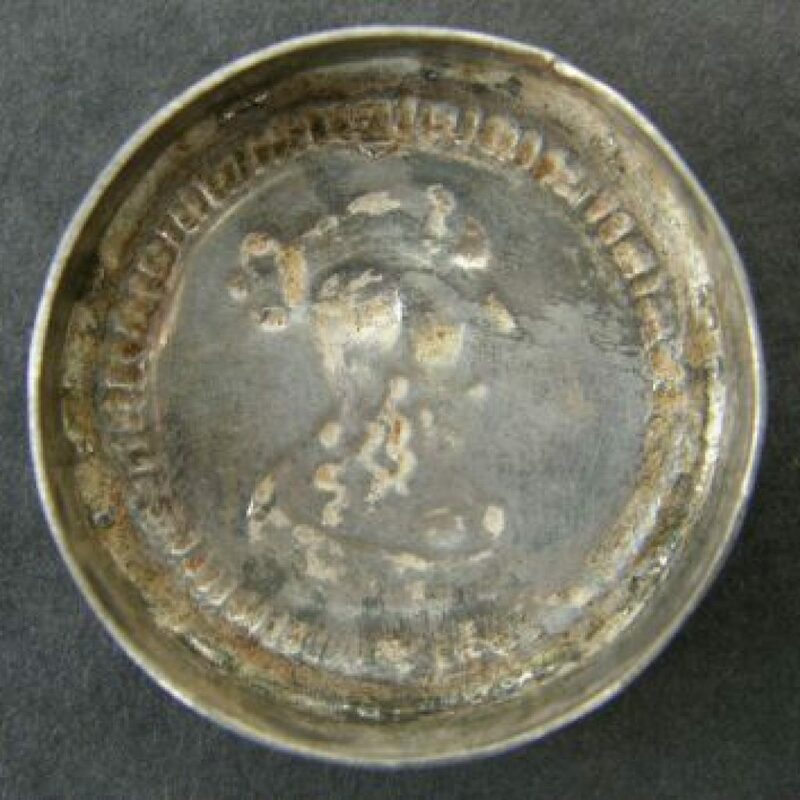 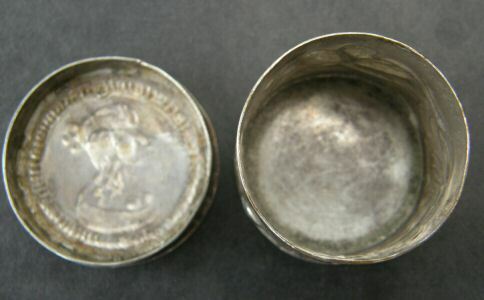 The revers of the lid shows incuse impression of top. 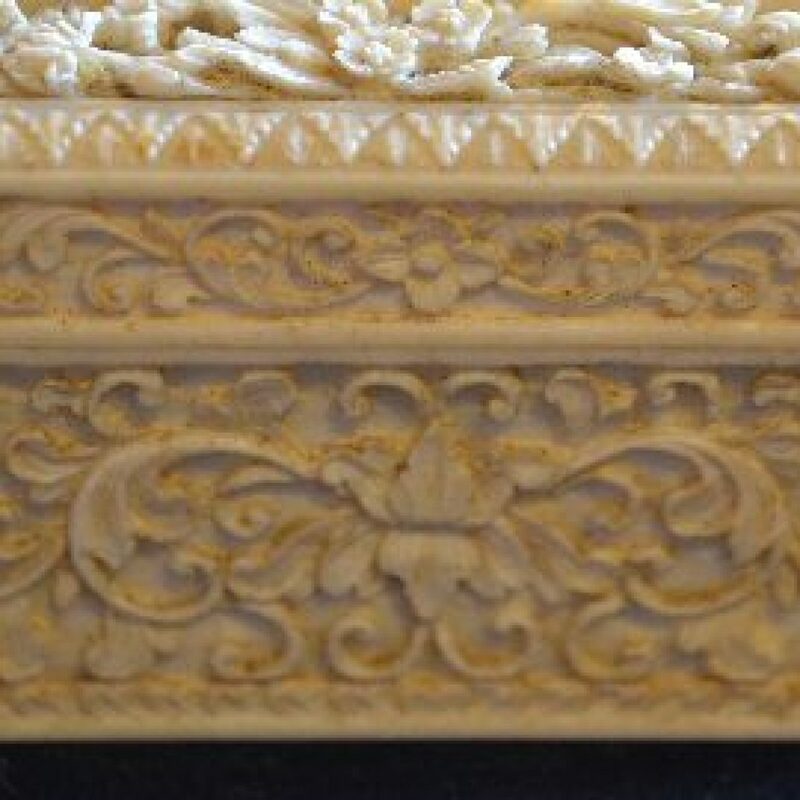 it is covered with floral designs. 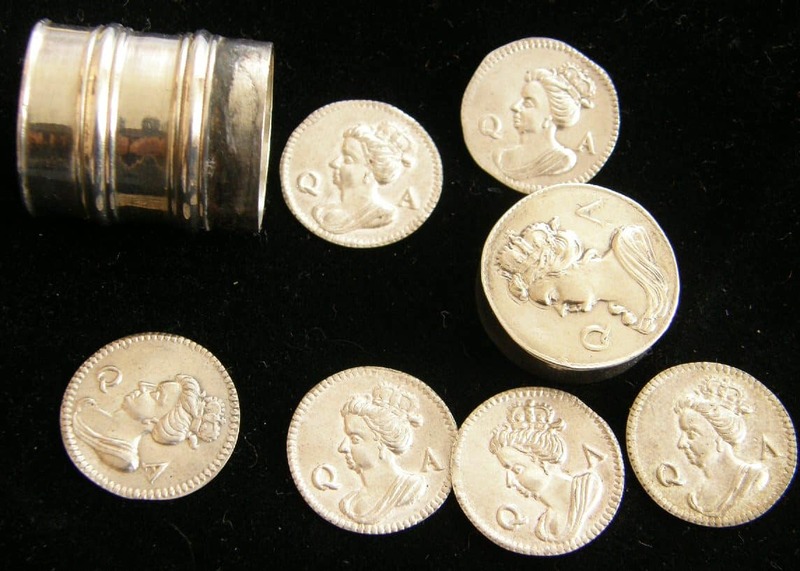 c1710 Tall Queen Anne Silver Gaming Counter box with six silver counters. 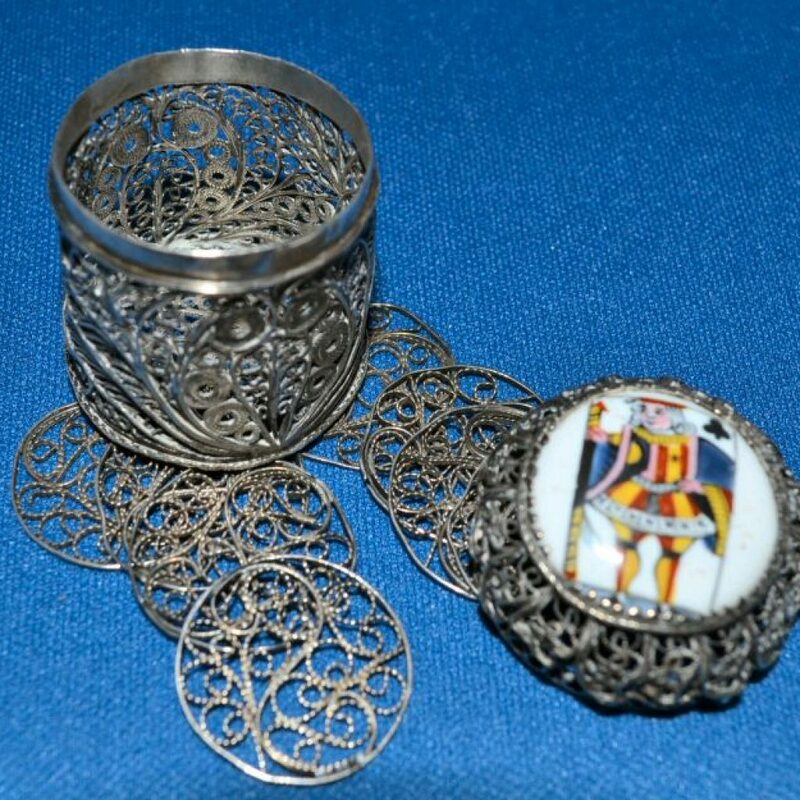 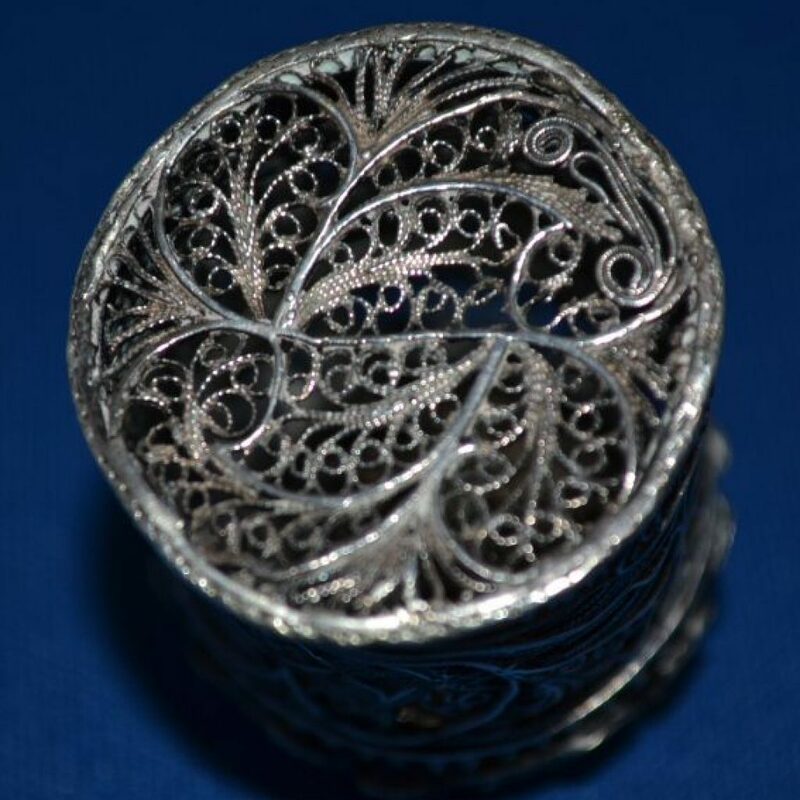 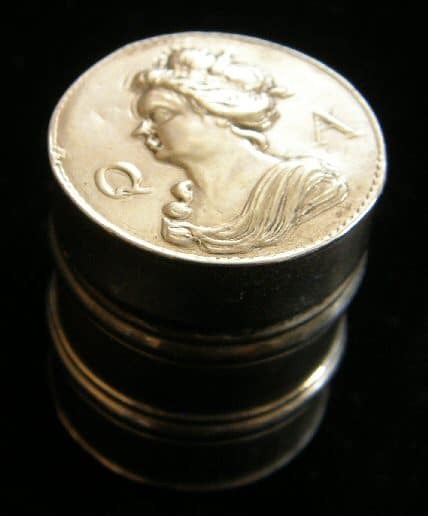 A silver cylindrical Queen Anne Counter Box 22mm in diameter and 26mm high, it weighs 8 grams empty. 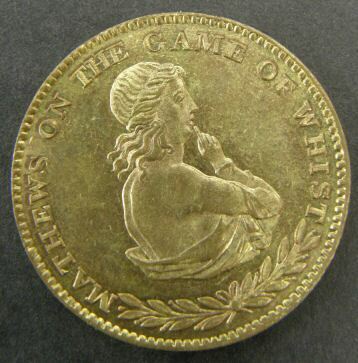 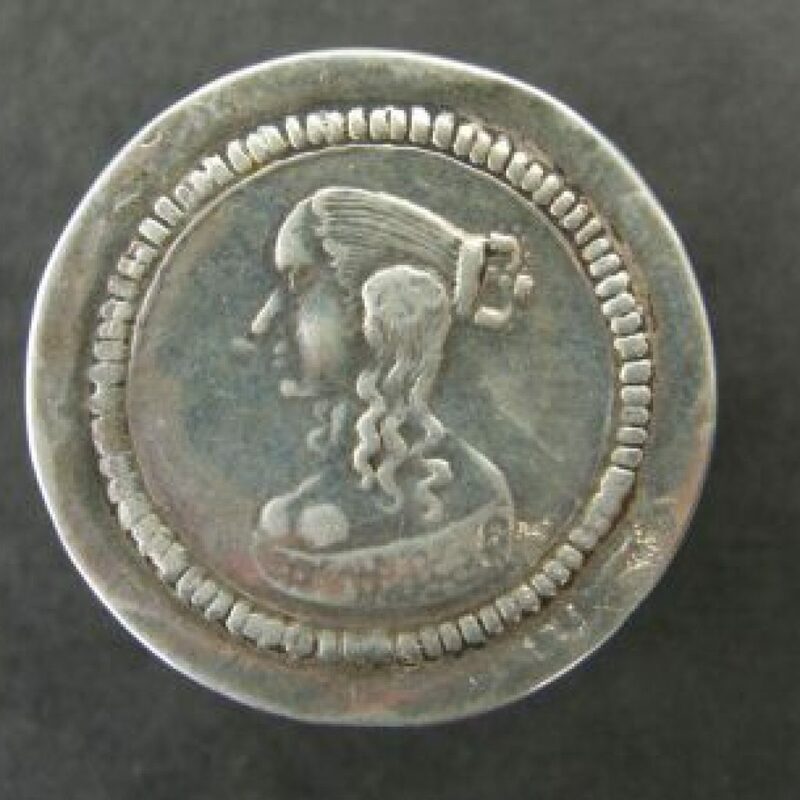 The top has bust of Queen Anne “bare headed, Queen Anne facing to the left, hair tied by ribbon” at sides Q-A. 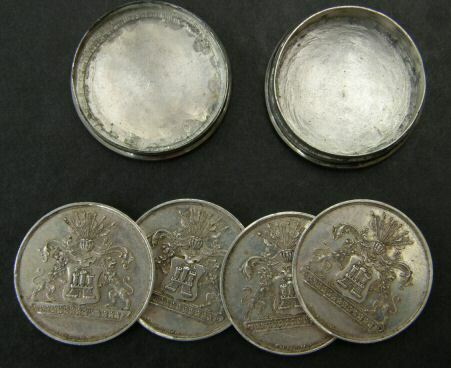 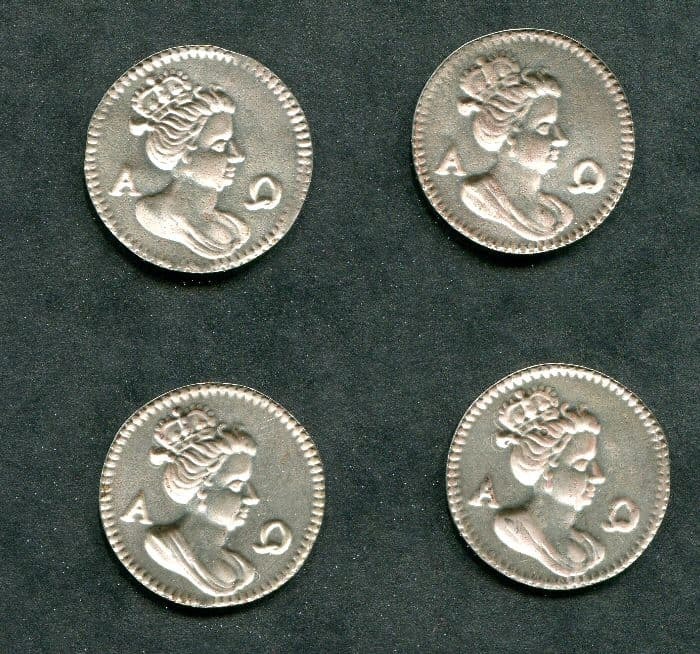 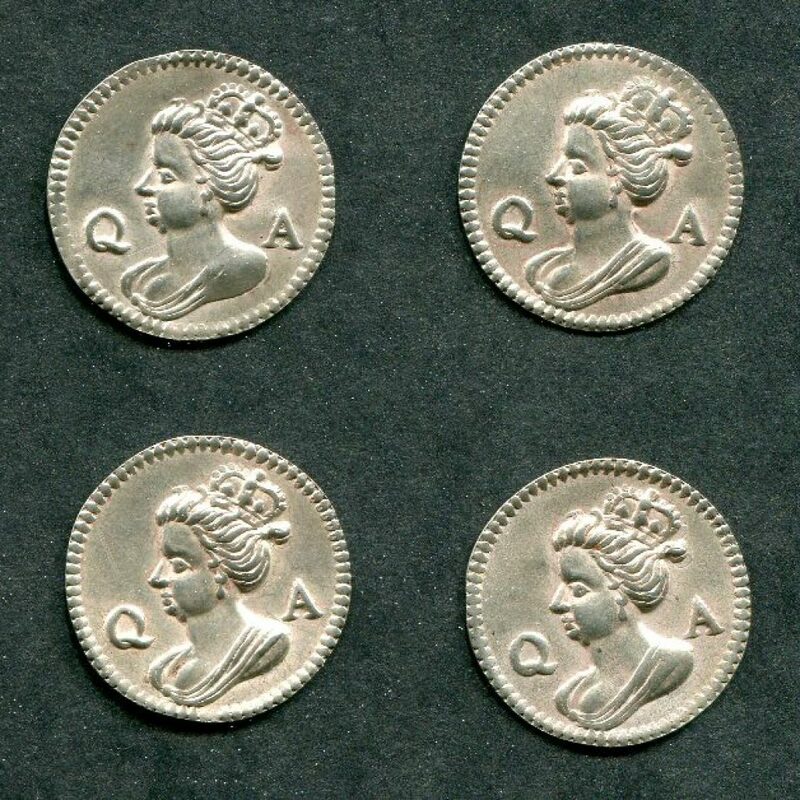 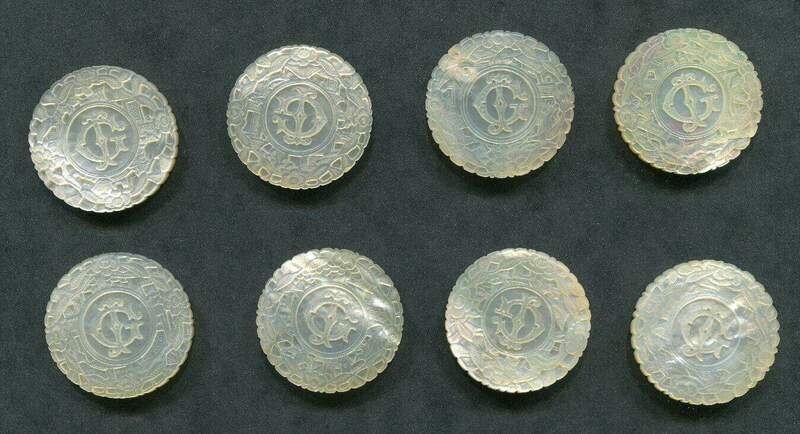 There are six Royalist silver bracteate counters; the case probably held 50 when initially sold. 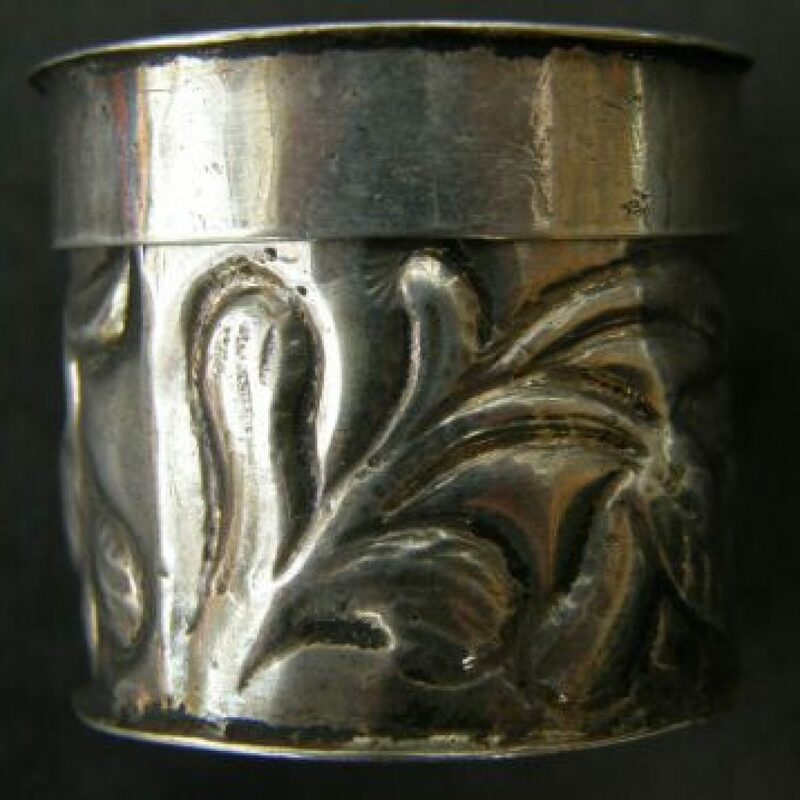 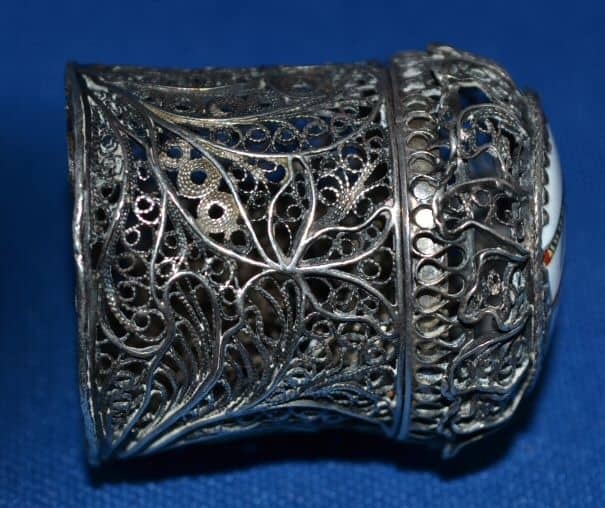 Silversmith in the late 17th century / early 18th century. 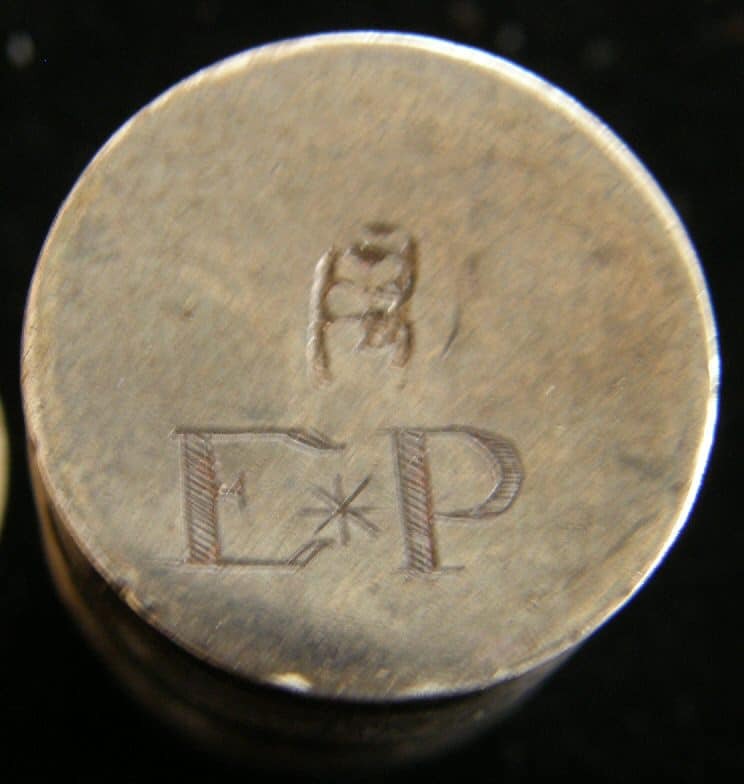 He was a maker of small boxes, nutmeg holders etc. 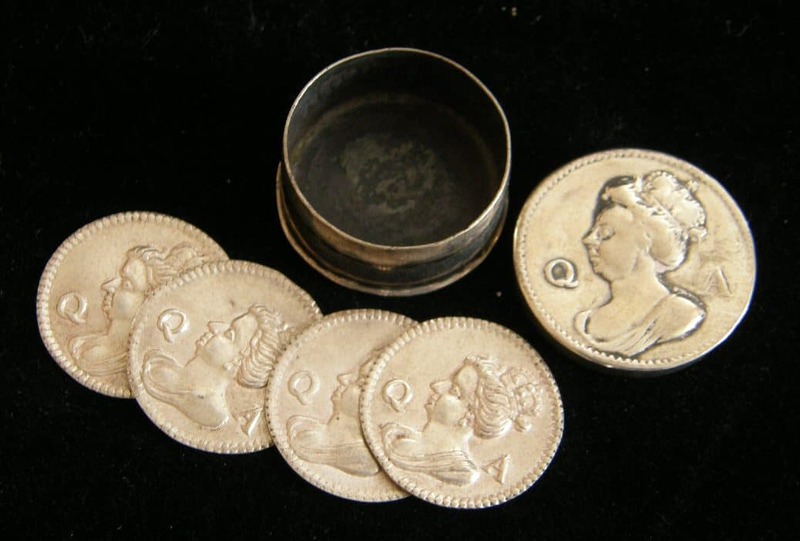 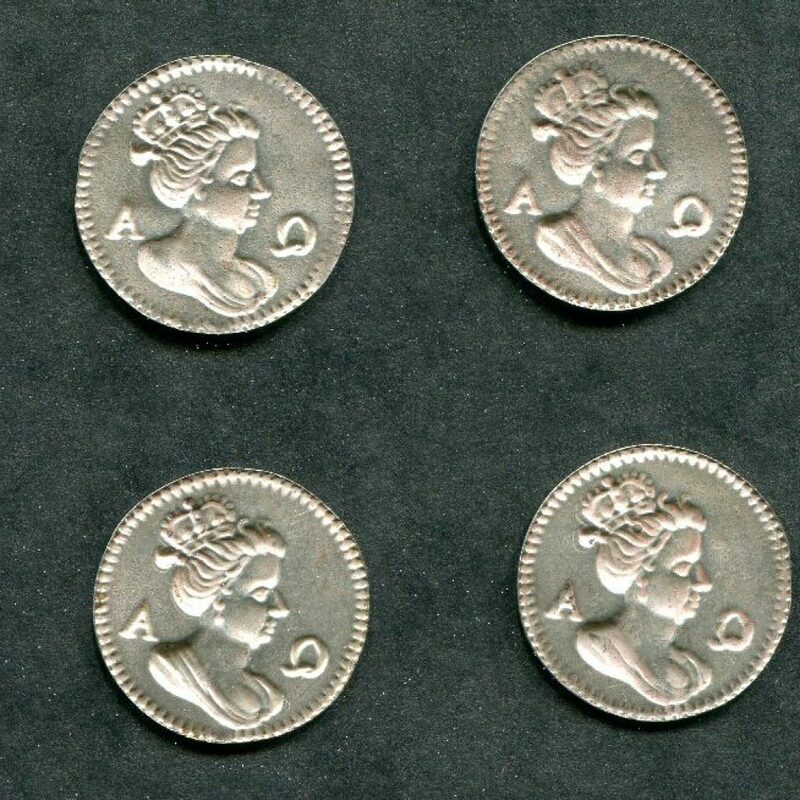 Medallic Illustrations of the History of Great Britain and Ireland – Plate CXXXVII numbers 10,11,12,13 which are illustration of Queen Anne Counters; these above being item 13.
c1708 small Silver Queen Anne Gaming Counter box with four counters. 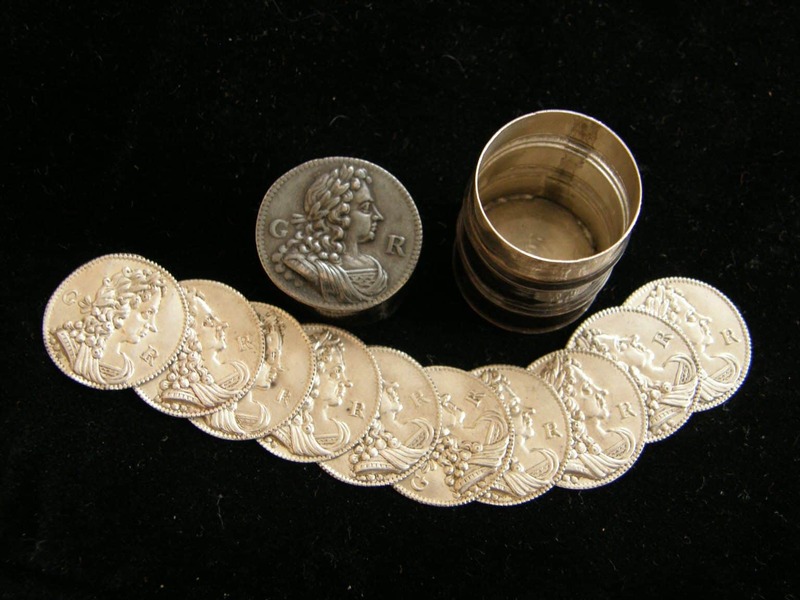 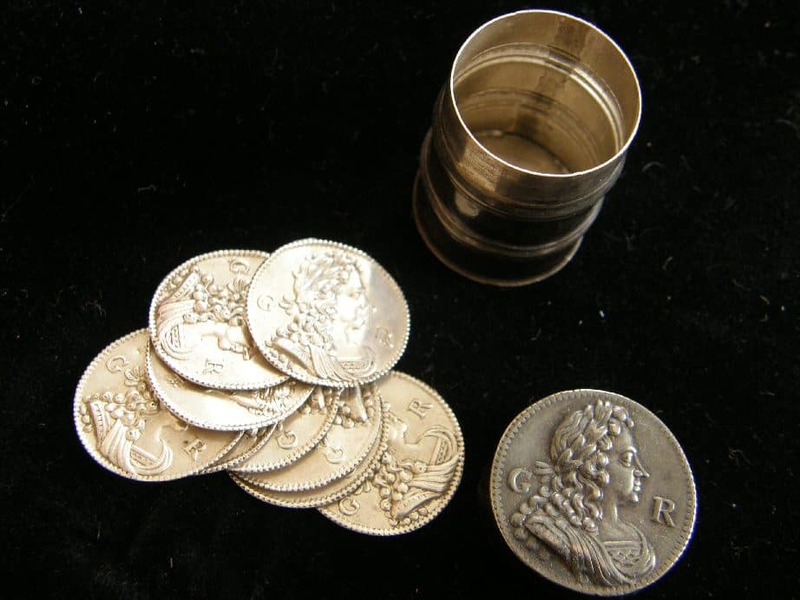 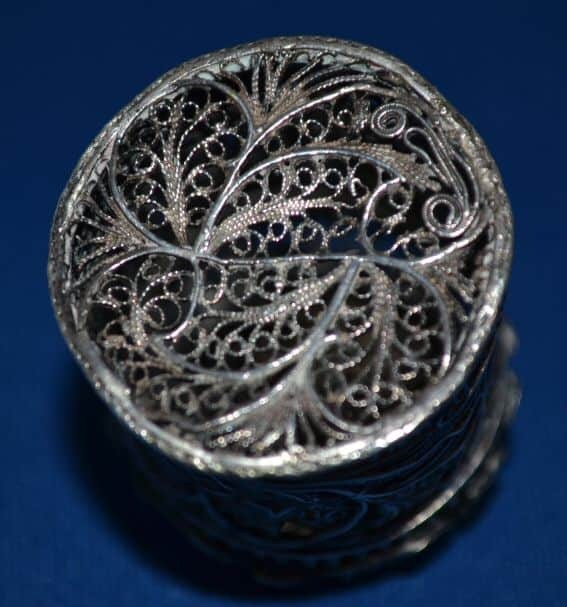 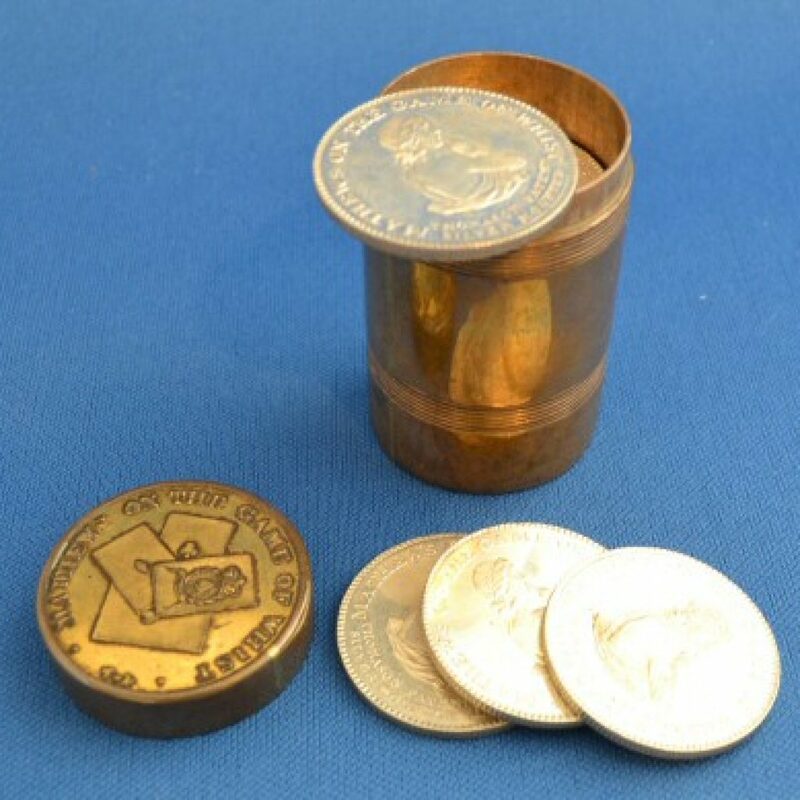 A silver cylindrical Queen Anne Counter Box 23mm in diameter and 10mm high, it weighs 5 grams empty. 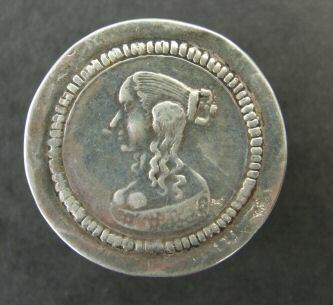 The top has bust of Queen Anne “bare headed, Queen Anne facing to the left, hair tied by ribbon” at sides Q-A. 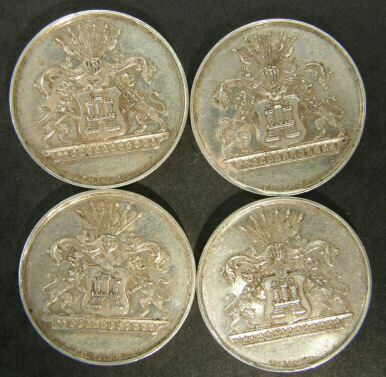 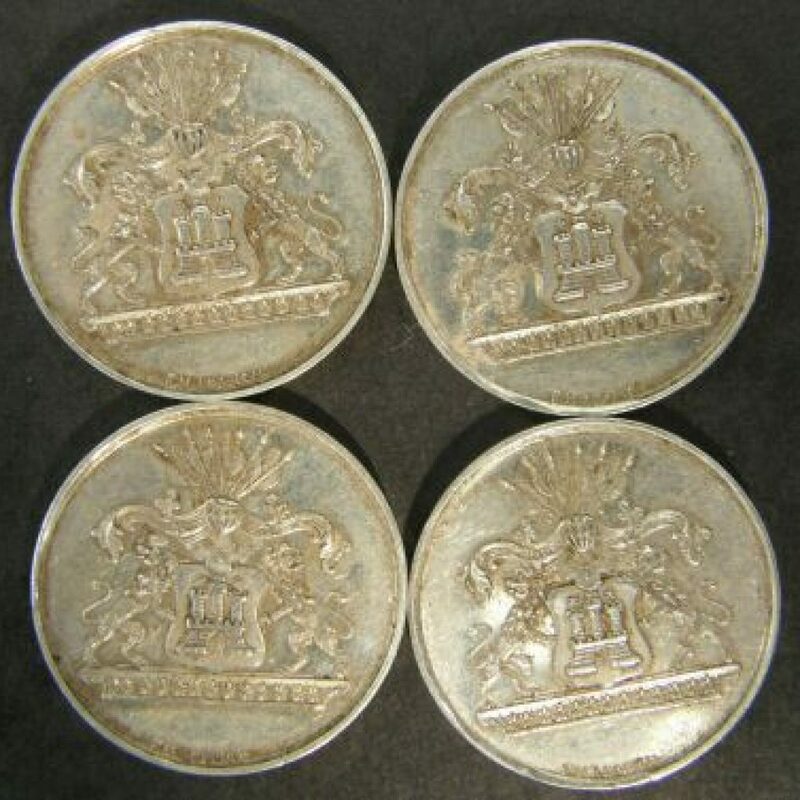 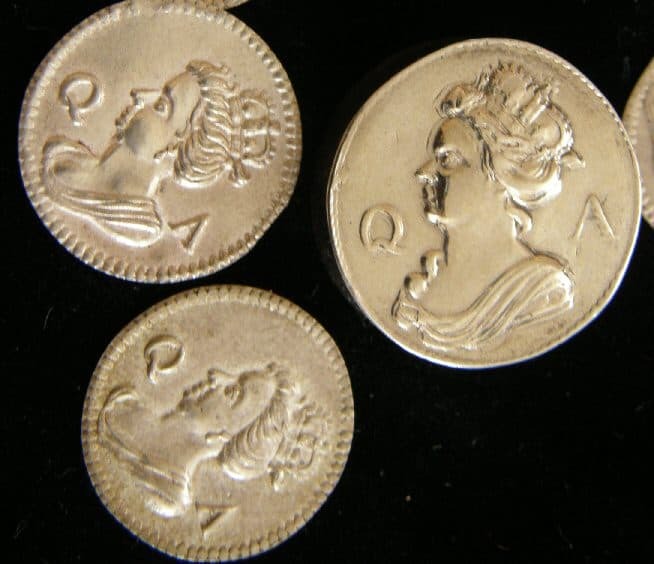 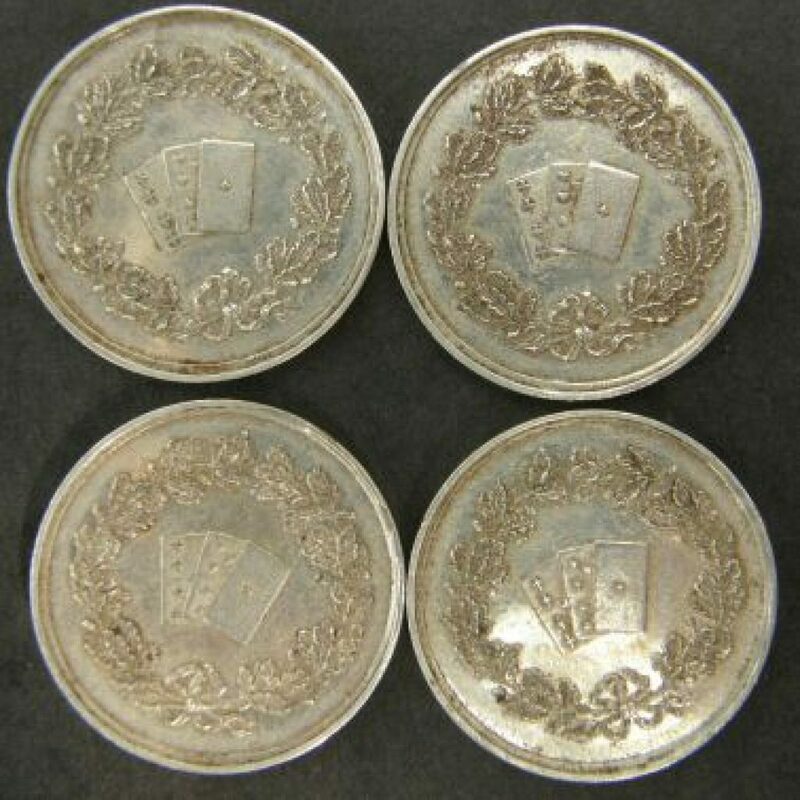 There are four Royalist silver bracteate counters; the case probably held 10 when initially sold. 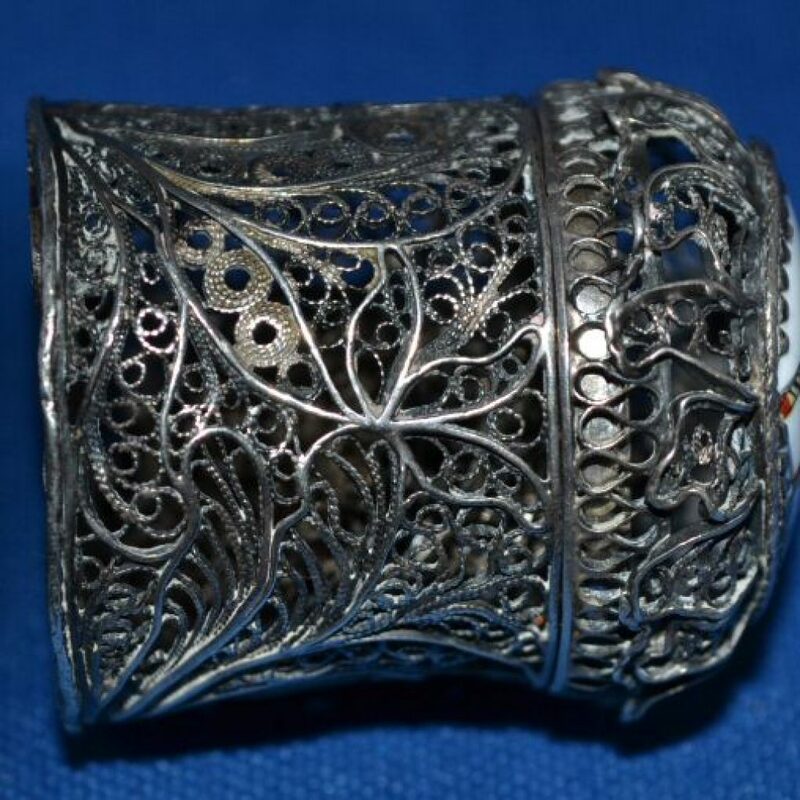 Thomas Kedder, Silversmith in the late 17th century / early 18th century. 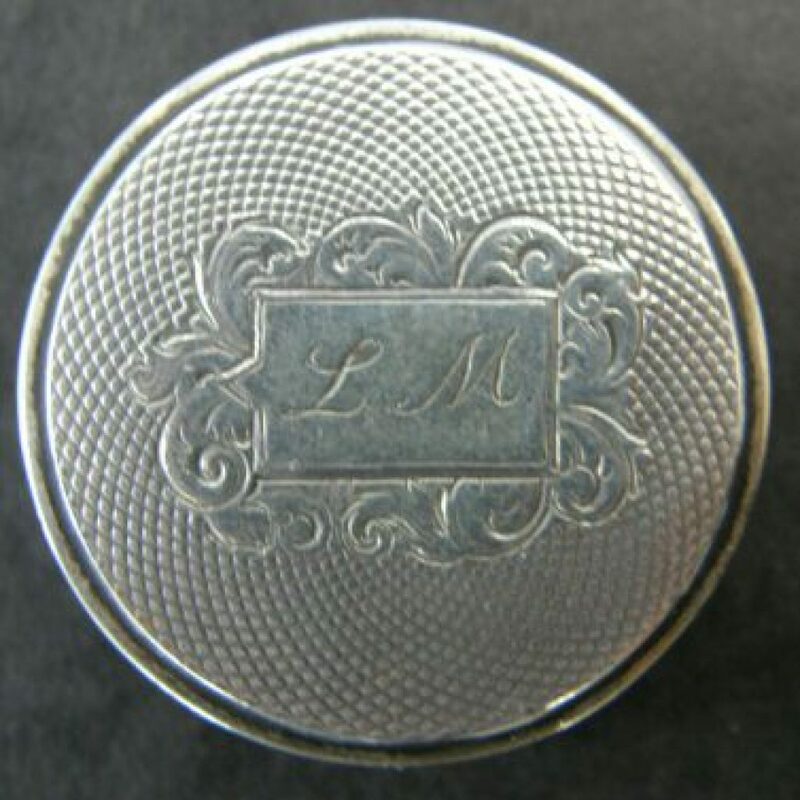 He was a maker of small boxes, nutmeg holders etc. 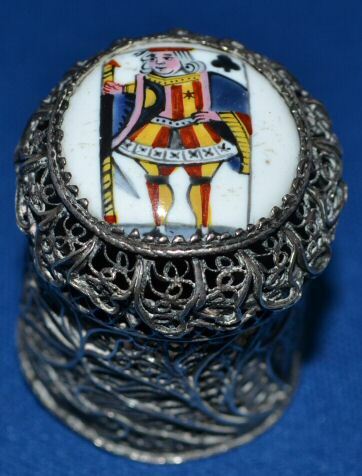 c1716 Large silver King George 1st Gaming Counter box with ten counters. 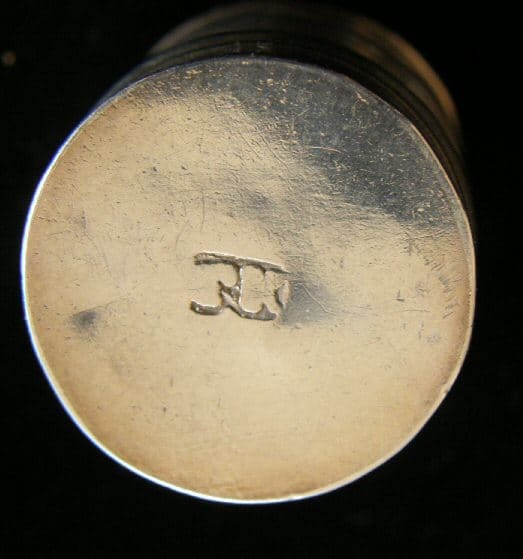 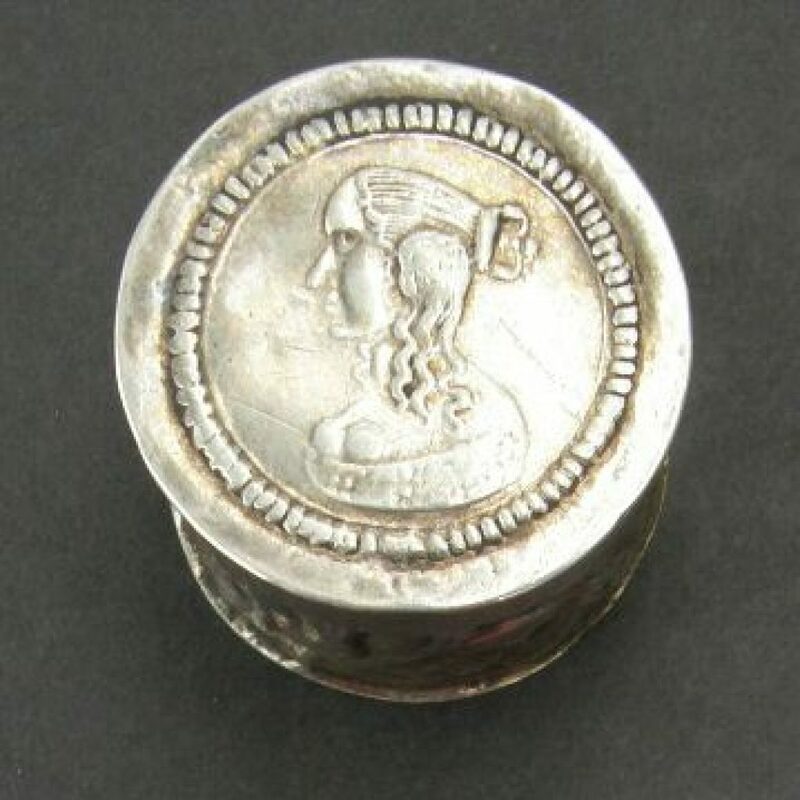 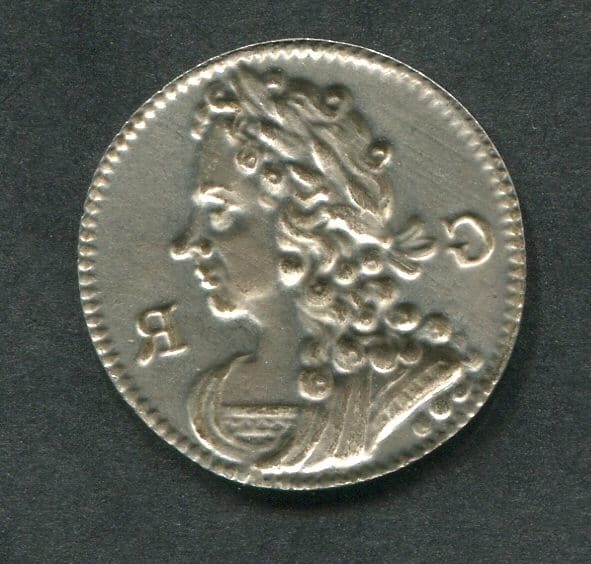 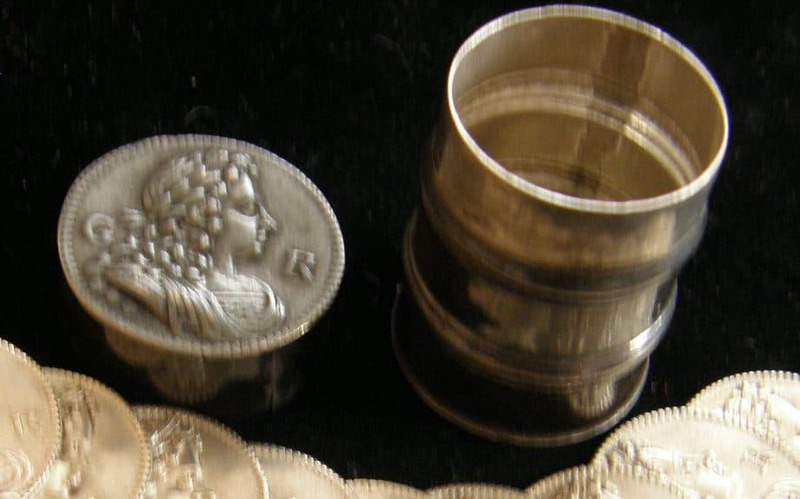 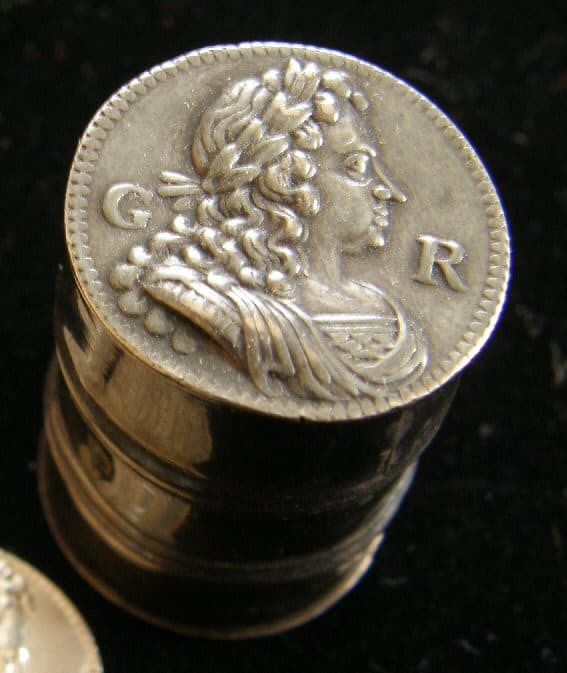 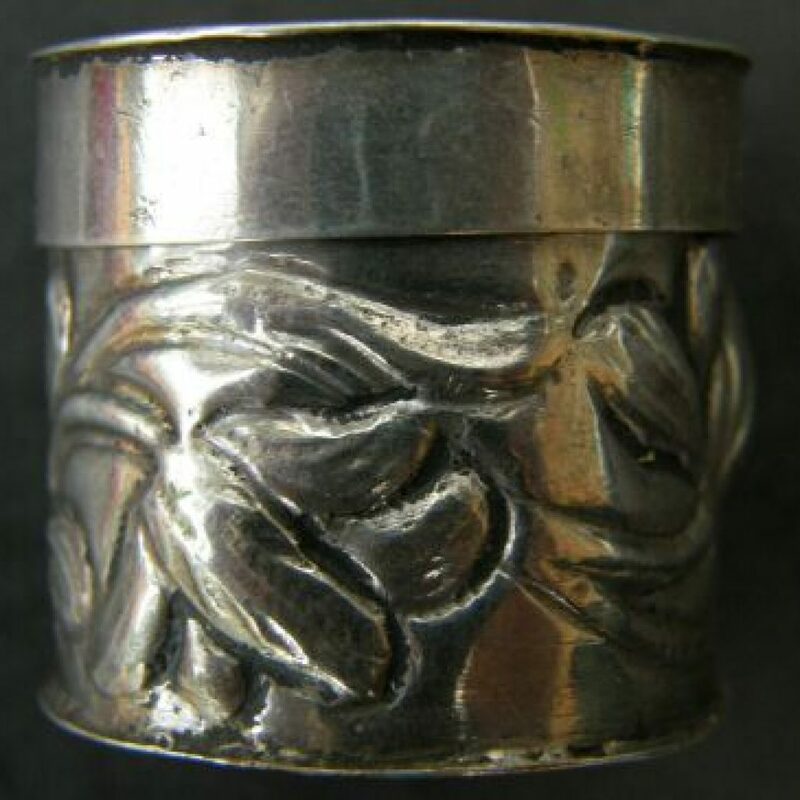 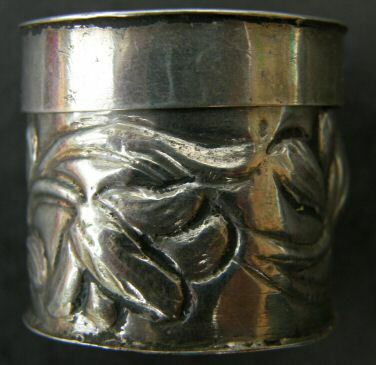 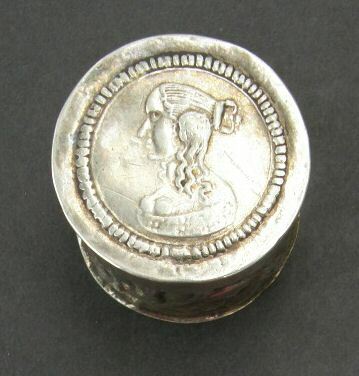 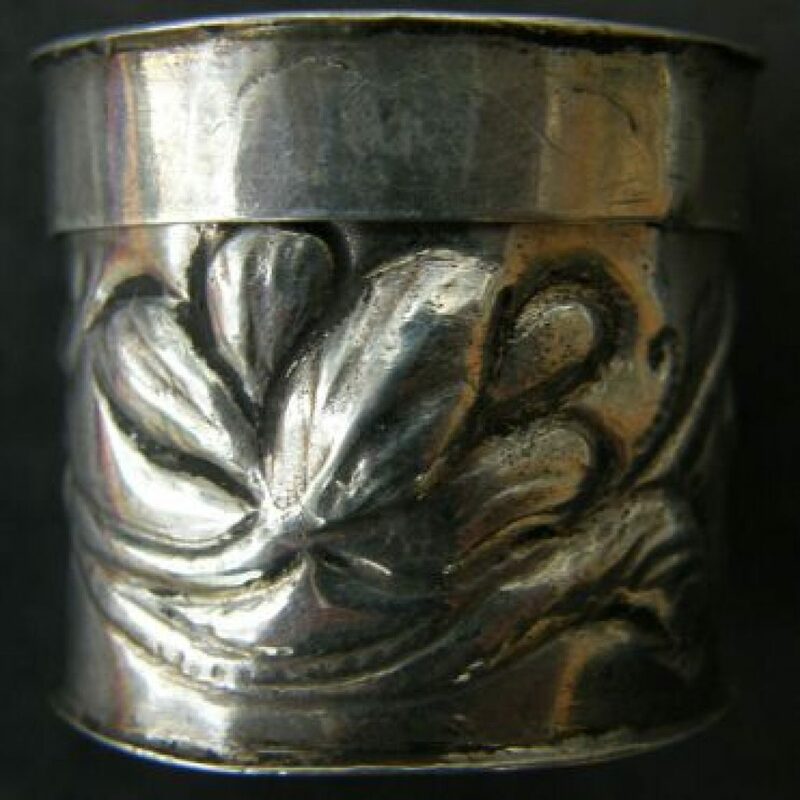 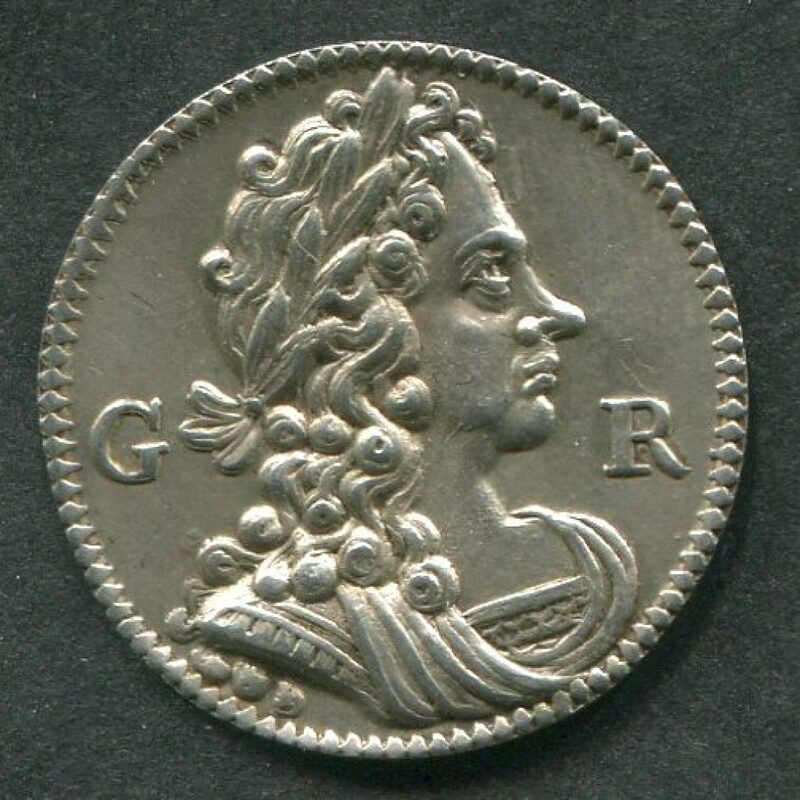 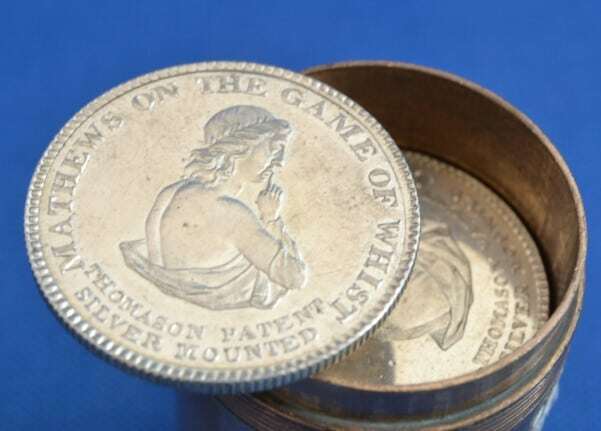 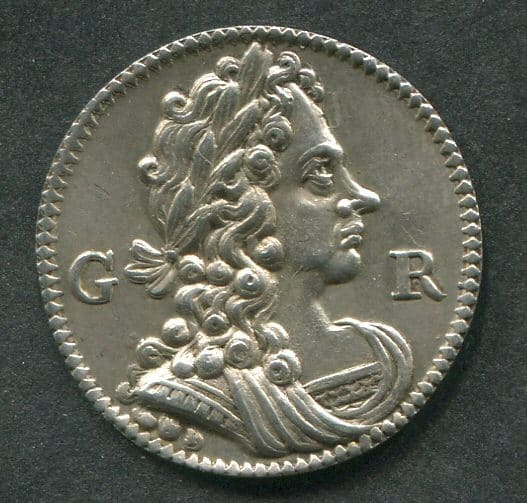 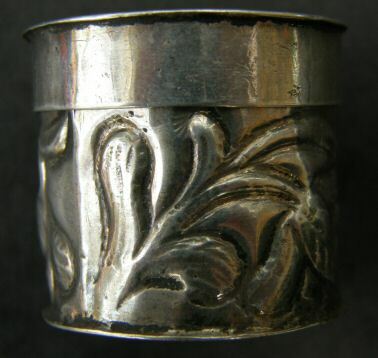 A silver cylindrical King George 1st Counter Box 23mm in diameter and 30mm high, it weighs 8 grams empty. 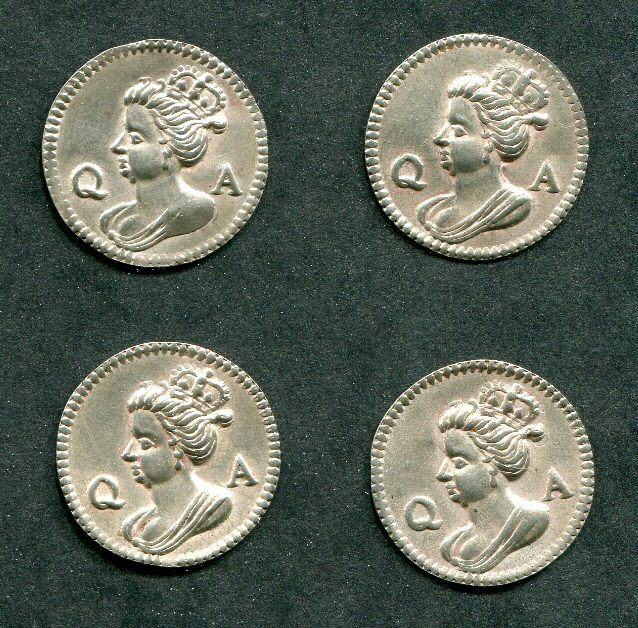 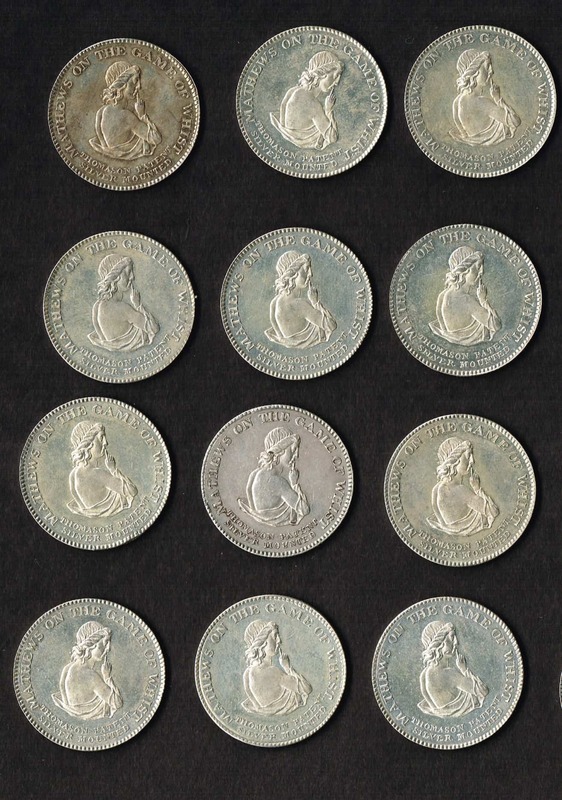 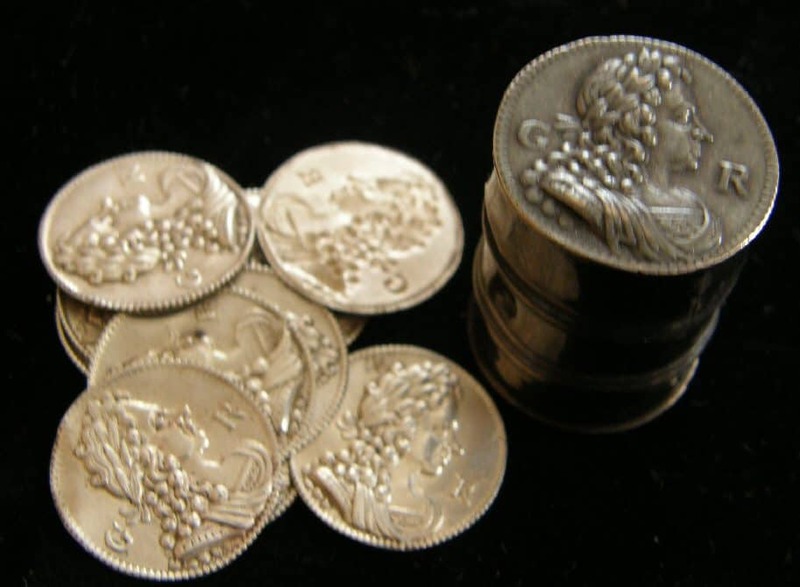 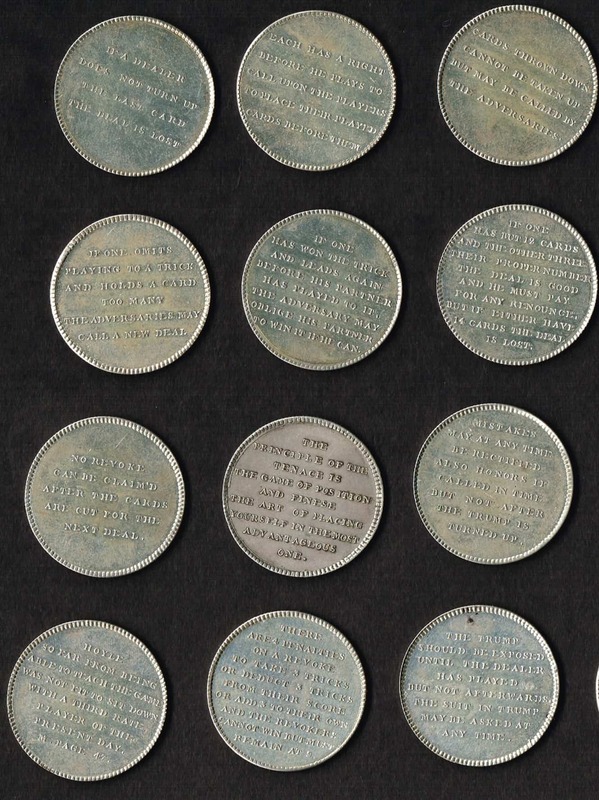 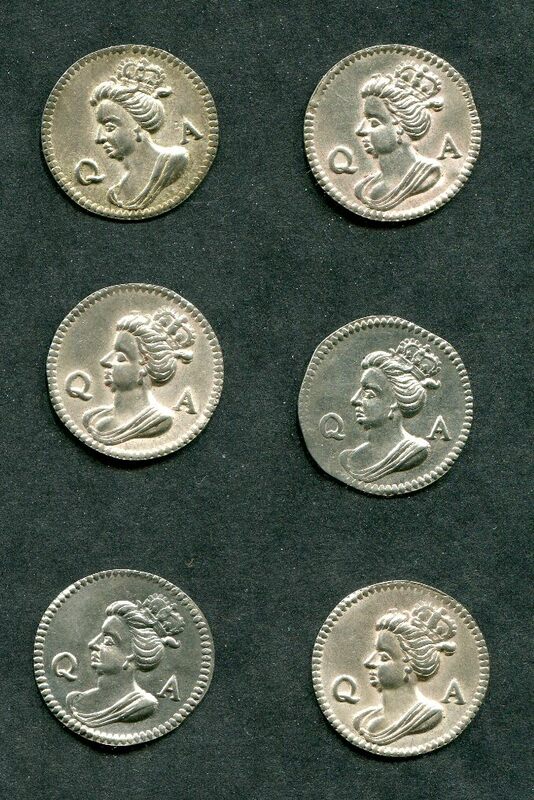 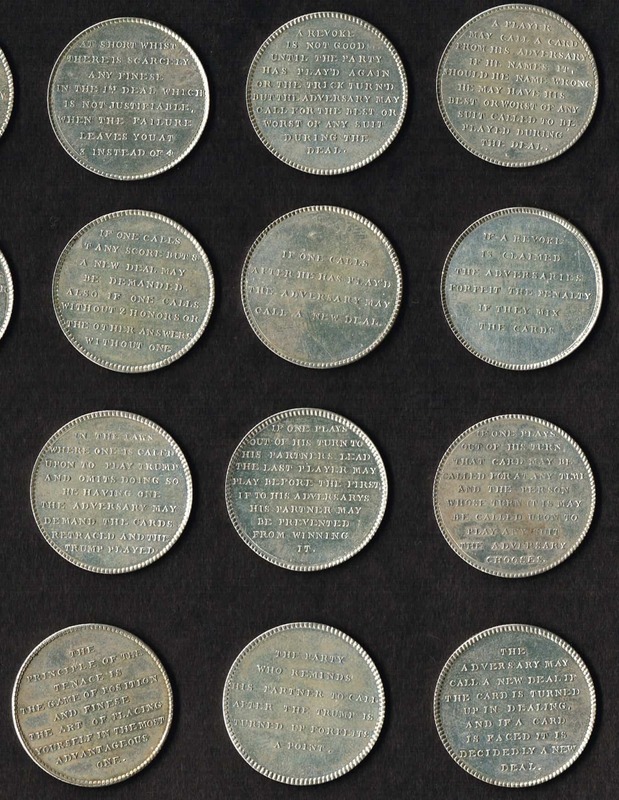 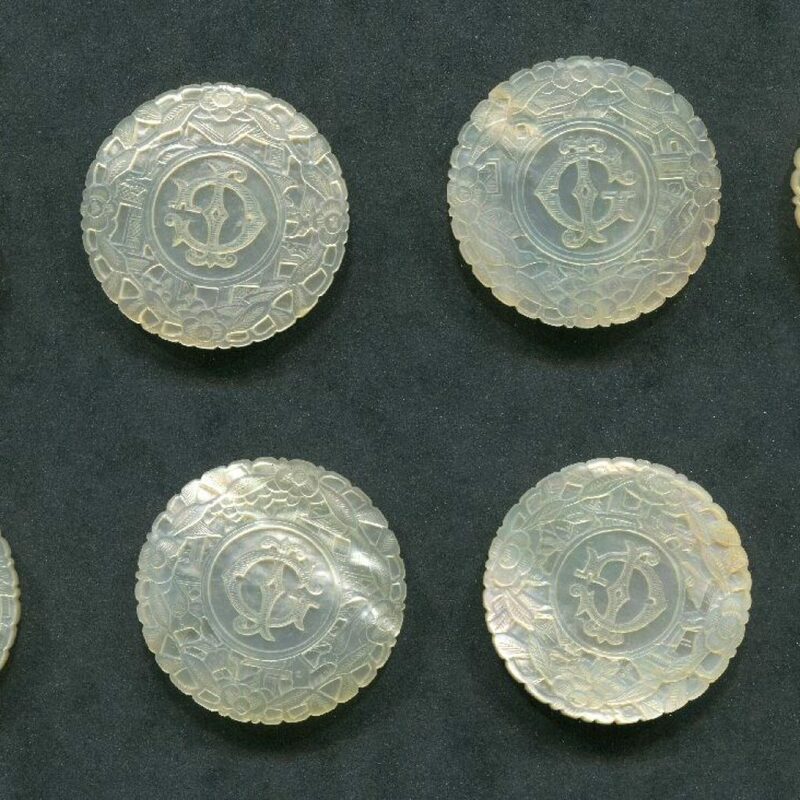 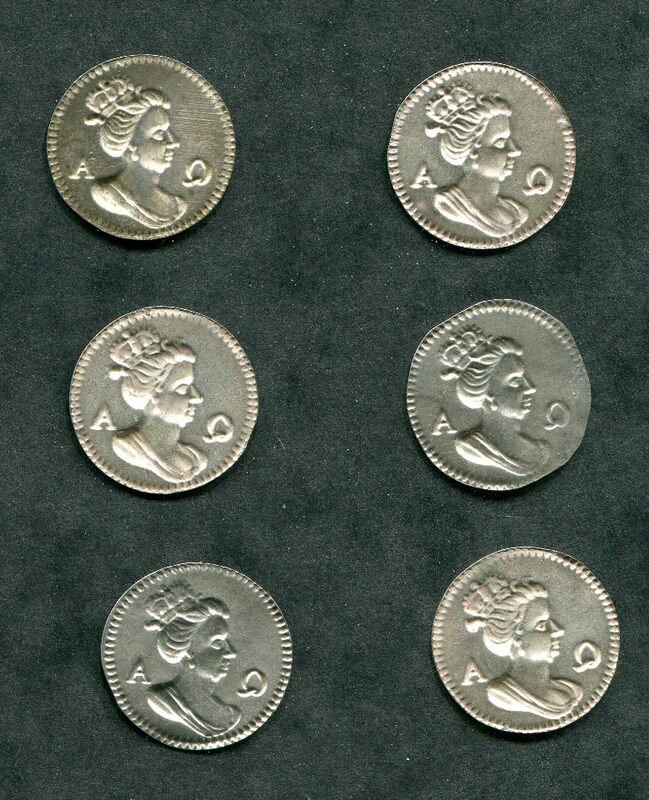 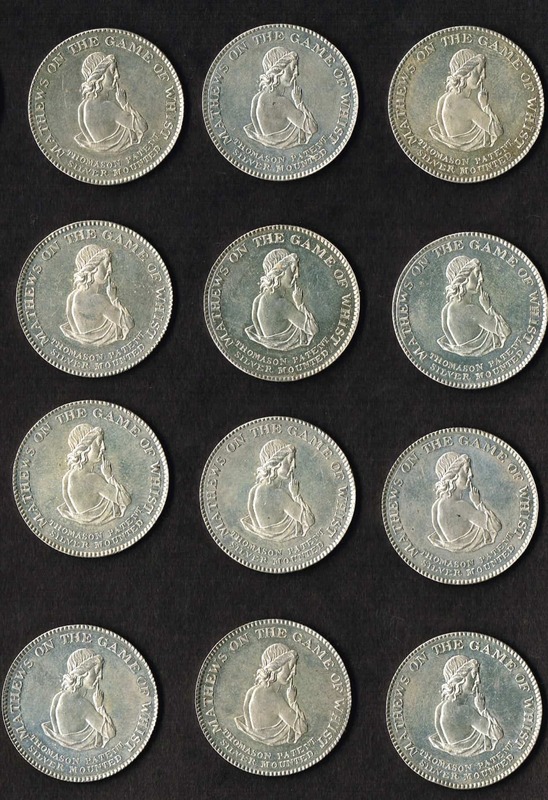 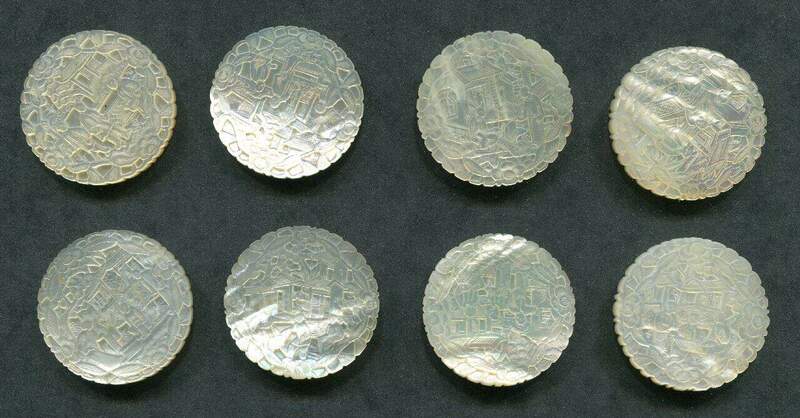 There are ten Royalist silver bracteate counters; the case probably held 50 when initially sold. 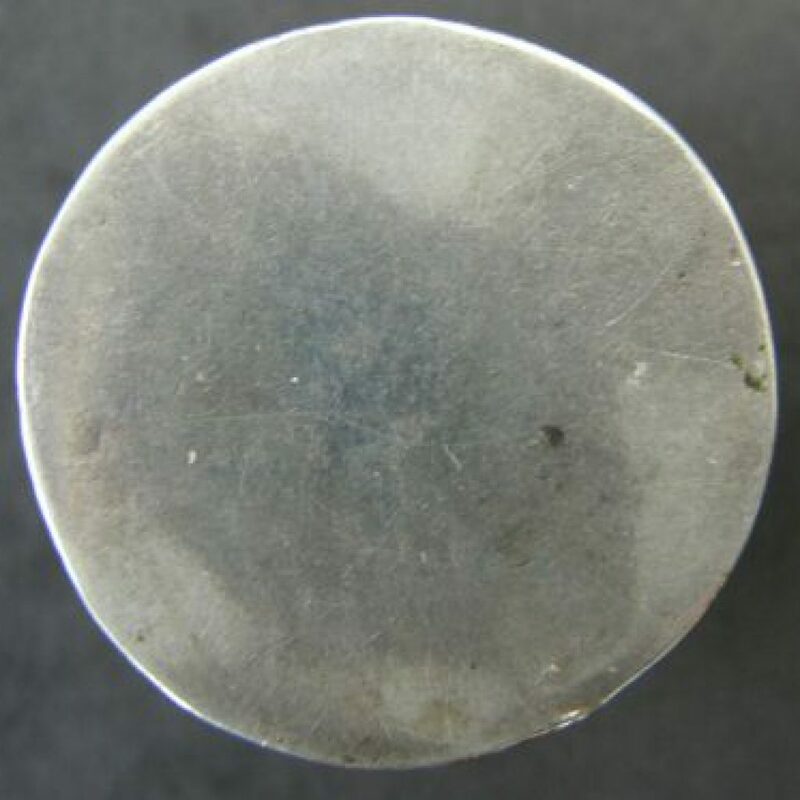 The counters are 19mm in diameter and the box with counters weighs 14 grms. 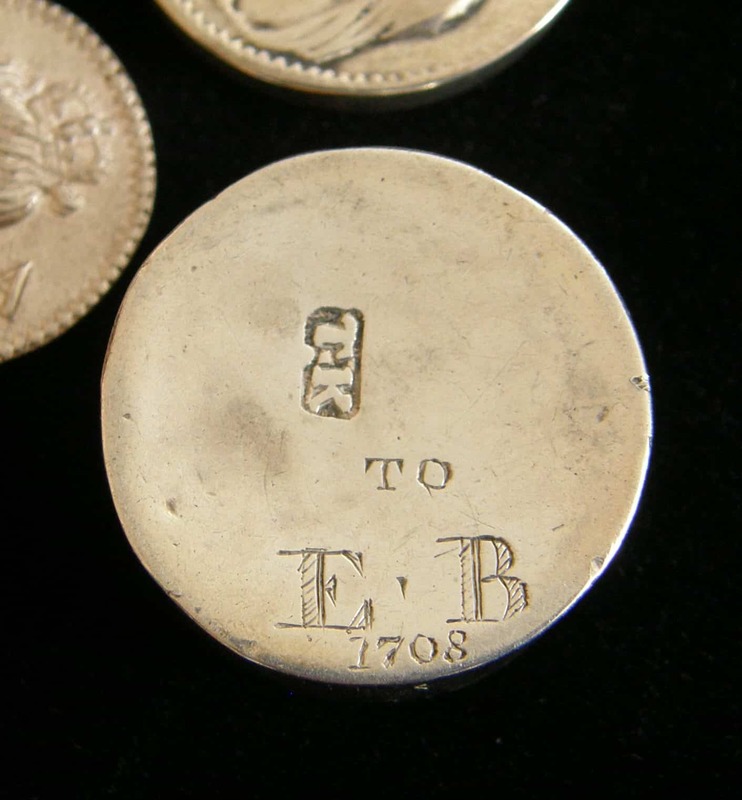 Thomas Kedder, Silversmith in the late 17th century / early 18th century. He was a maker of small boxes, nutmeg holders etc. 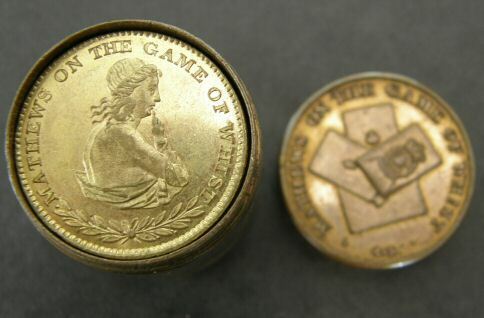 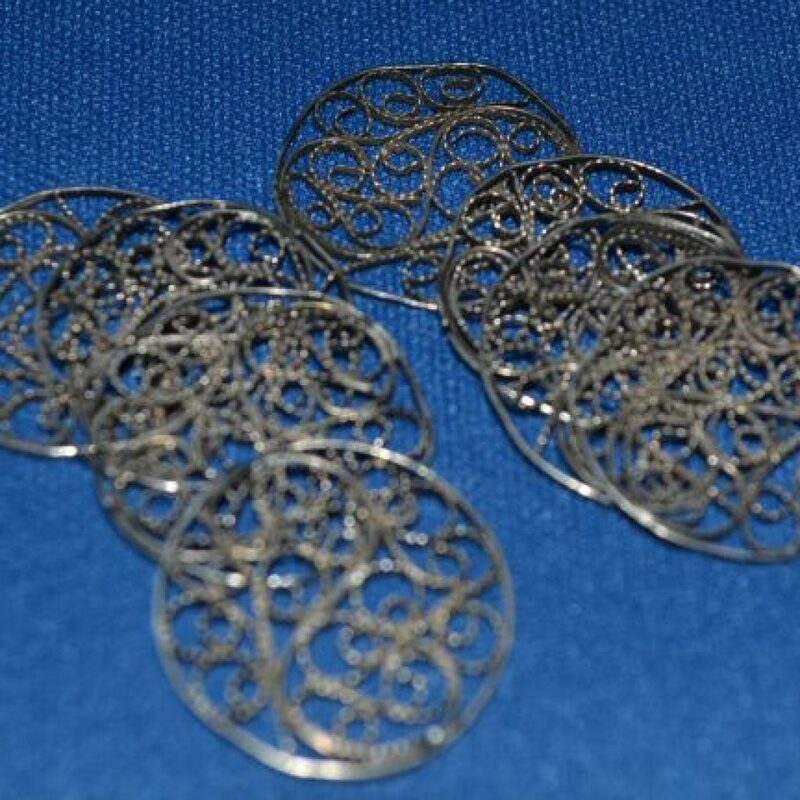 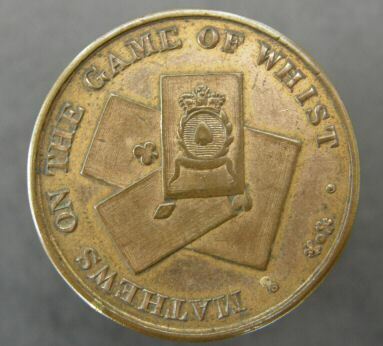 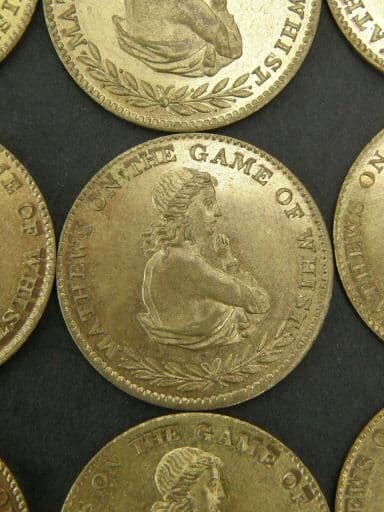 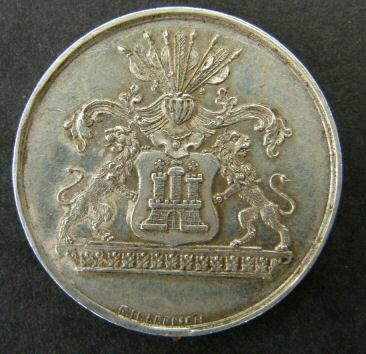 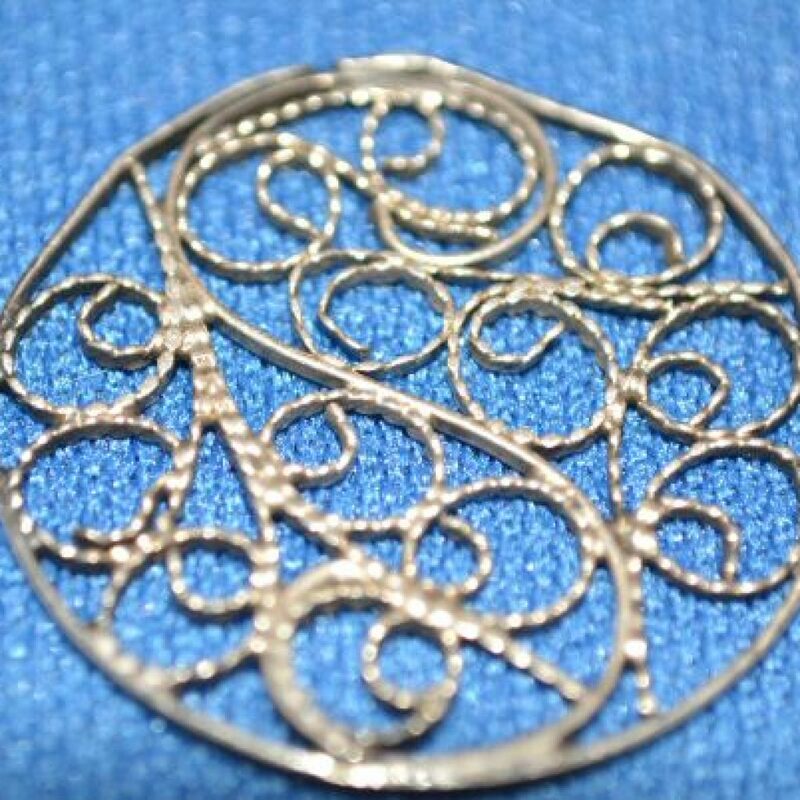 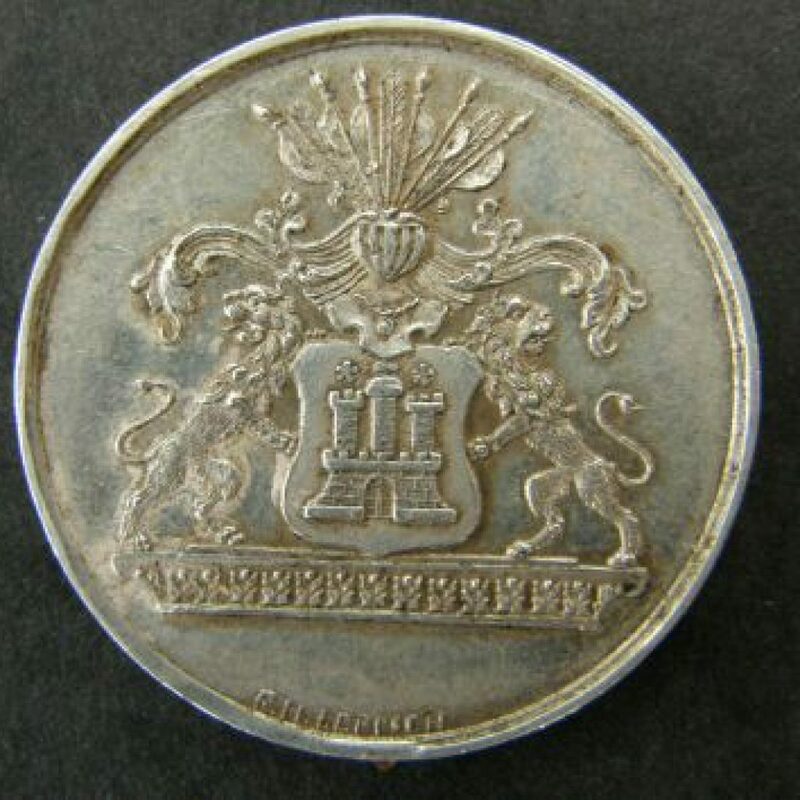 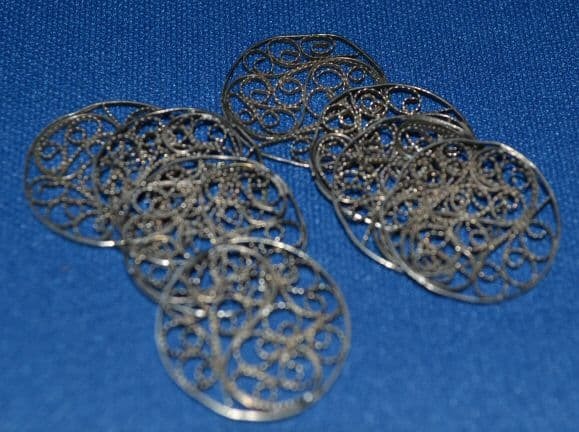 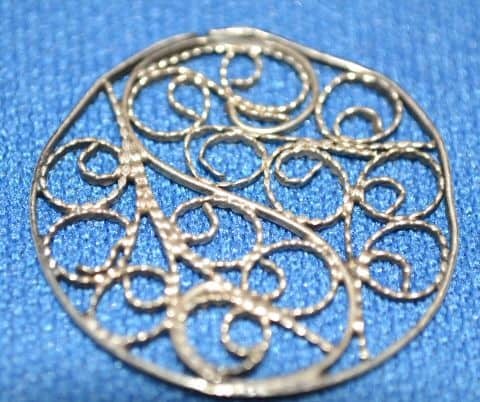 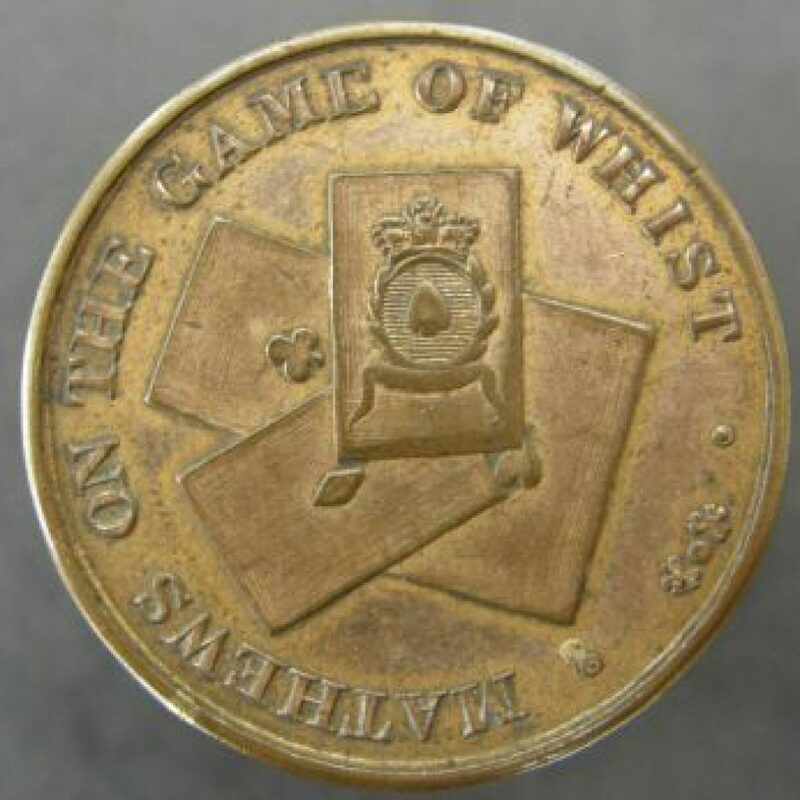 A Royalist silver bracteate gaming counters measuring 19mm in diameter. 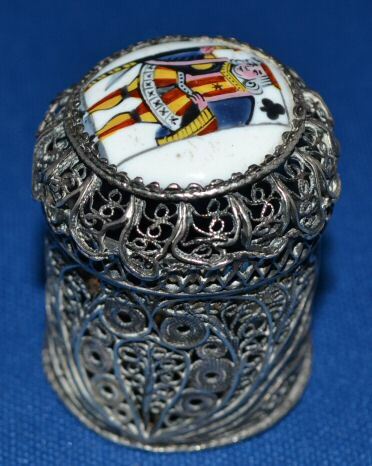 George III silver and enamel filigree counter box with counters. 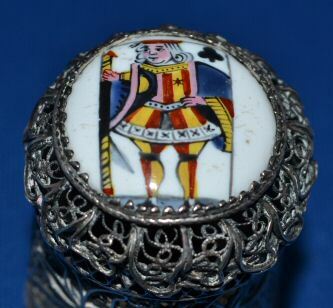 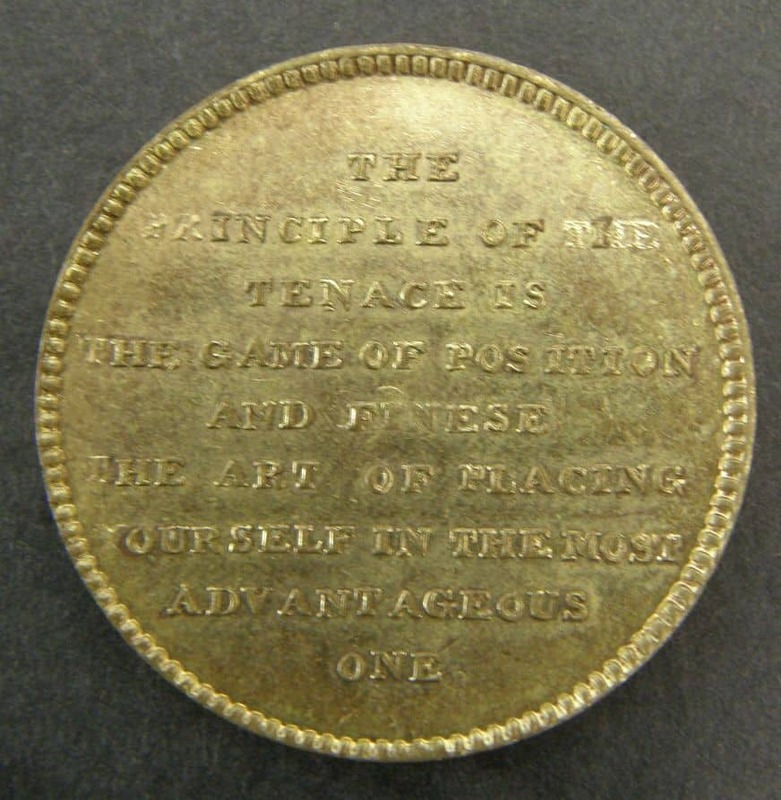 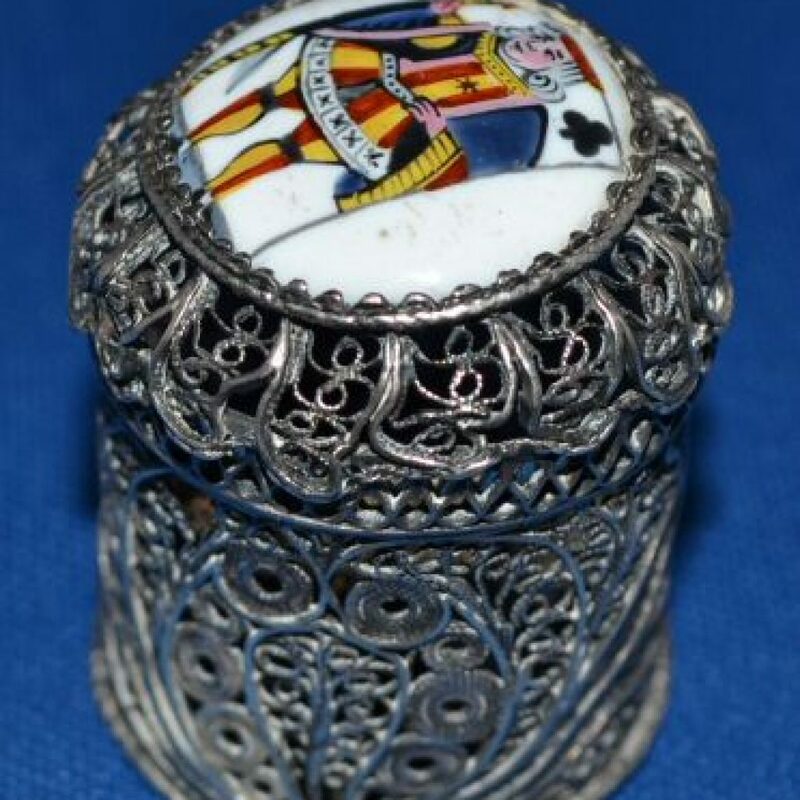 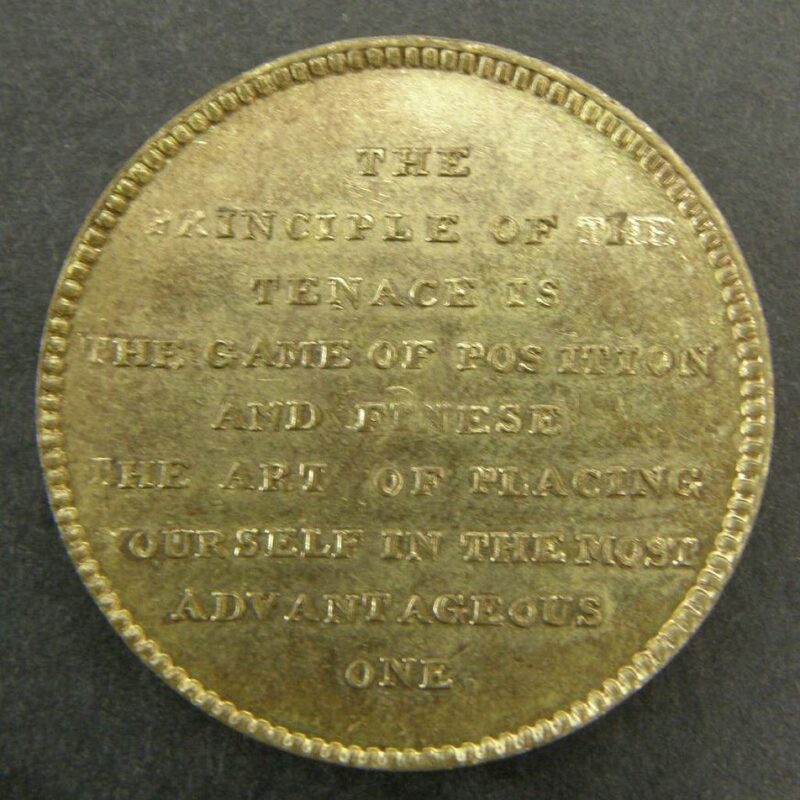 This item dates from circa 1785, the lid bearing an white enamel plaque of the single figure knave of clubs in standard English pattern format and colouring; the design is reminisant of the playing cards produced by HUNT in the late 18th Century. 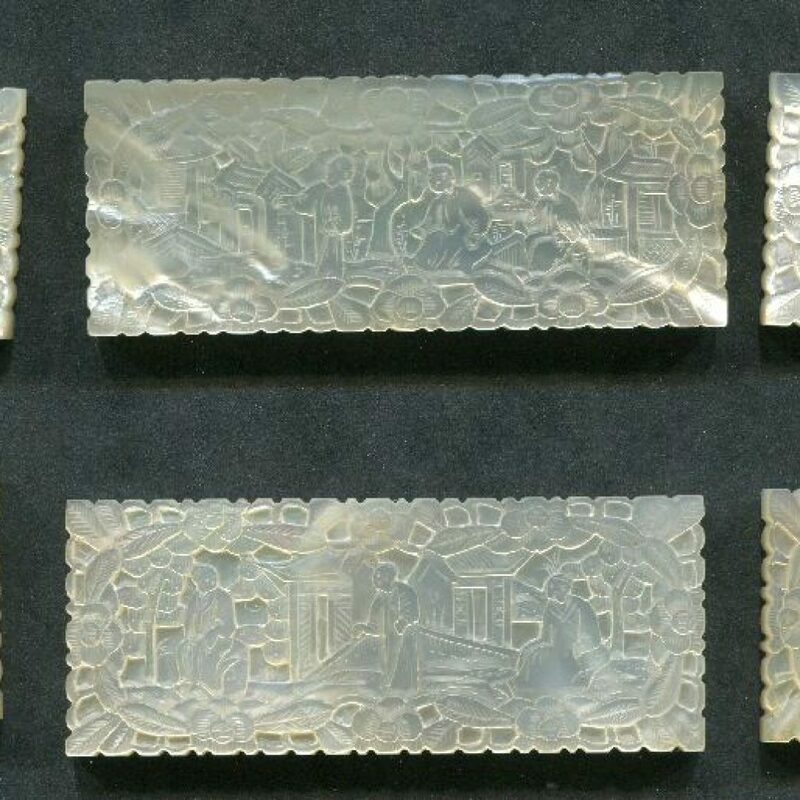 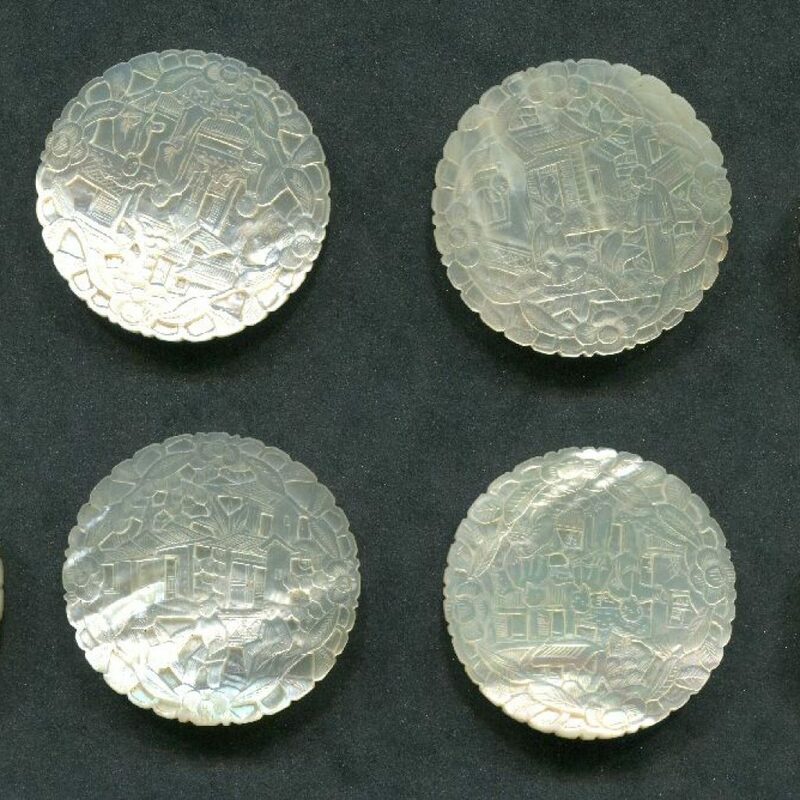 The box contains eight silver filligree counters [ it most probably contained 25 when originally made ]; these match the style of the counter box. 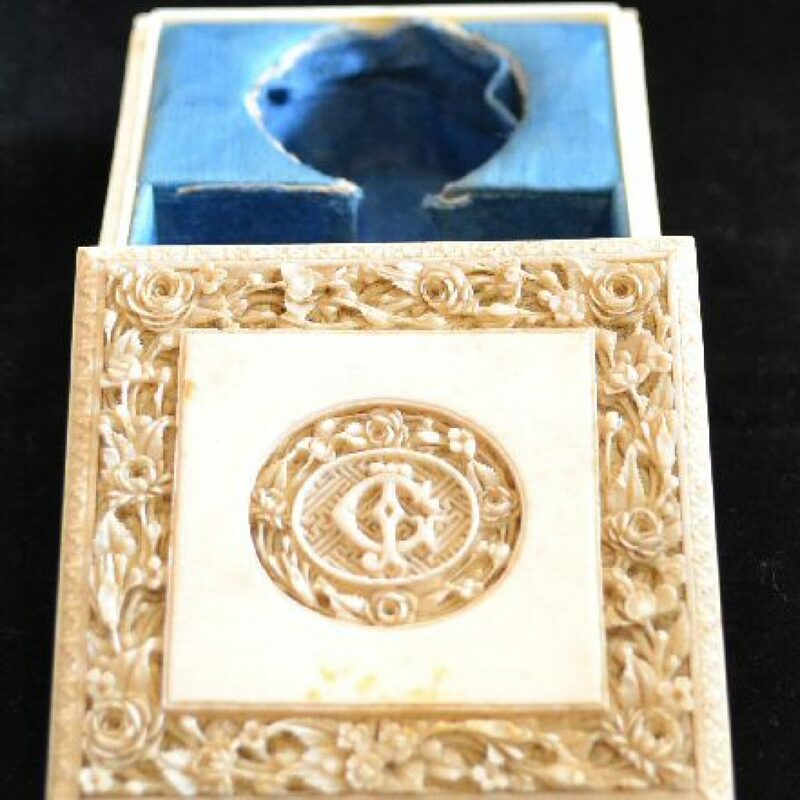 Counter box in this fine condition with counters.nave of clubs. 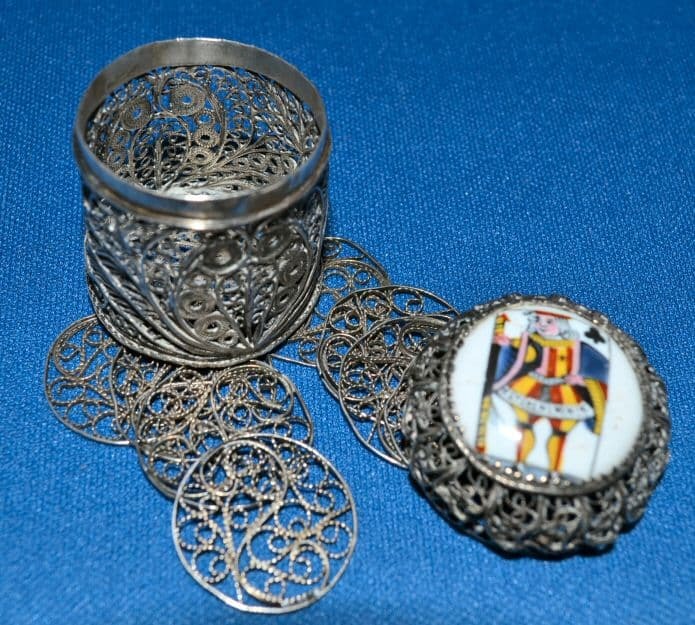 The box is decorated with two groups on circumferential Circles. 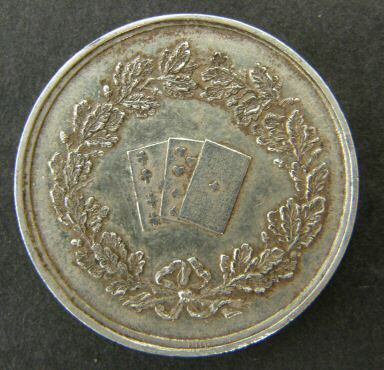 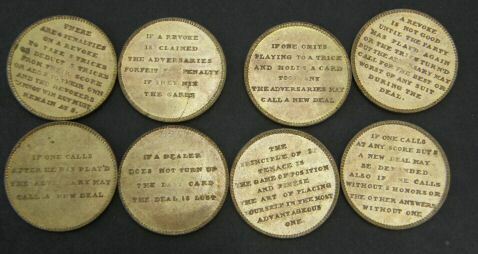 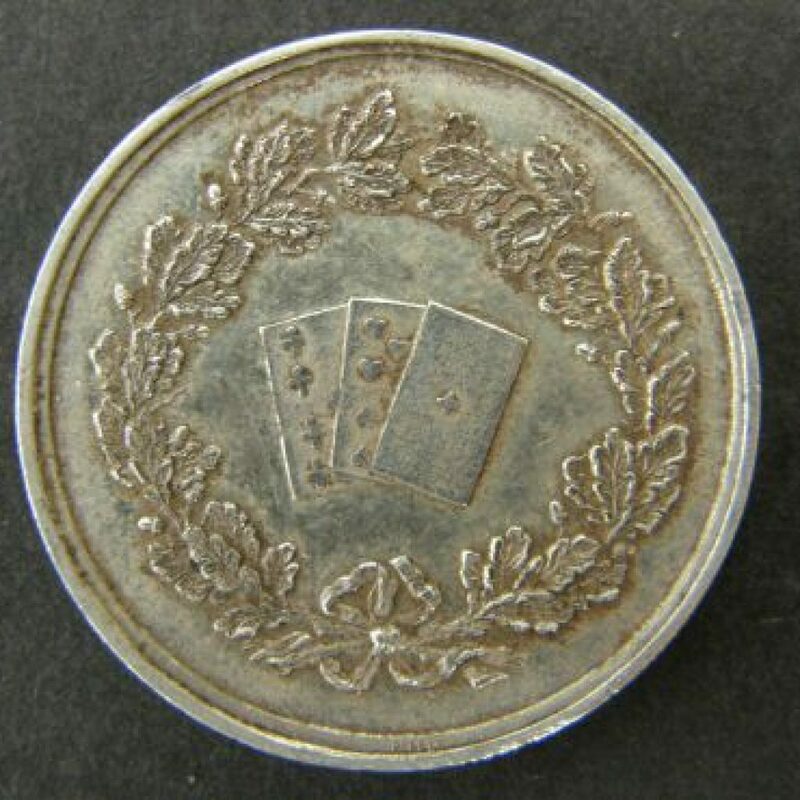 The lid shows four overlapping playing cards – the four aces with the duty ace [ Ace of Spades ] on top. 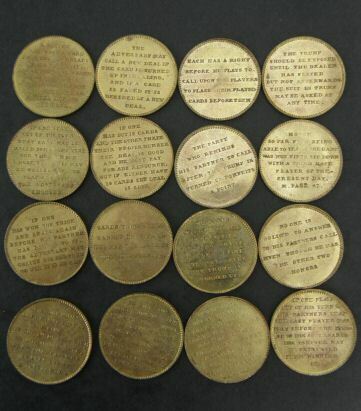 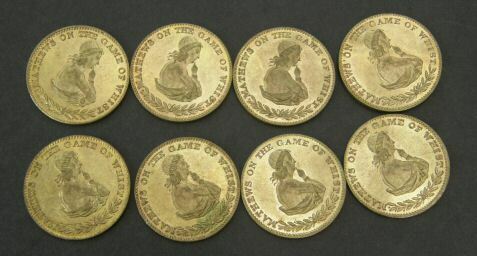 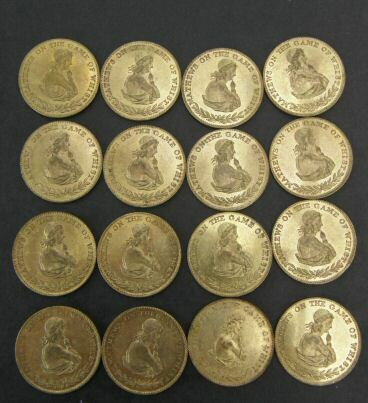 The box contains the complete set of 24 gilded latten counters each being 27mm in diameter. 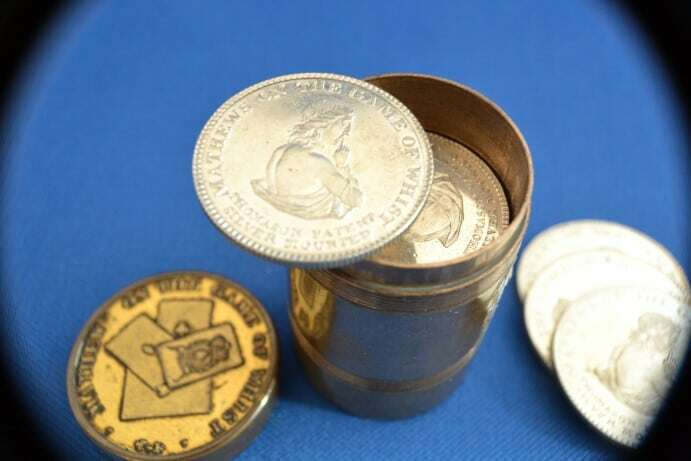 c1818 Boxed Set of 24 [ complete ] "Silver"
The box contains the complete set of 24 silver mounted counters each being 27mm in diameter. 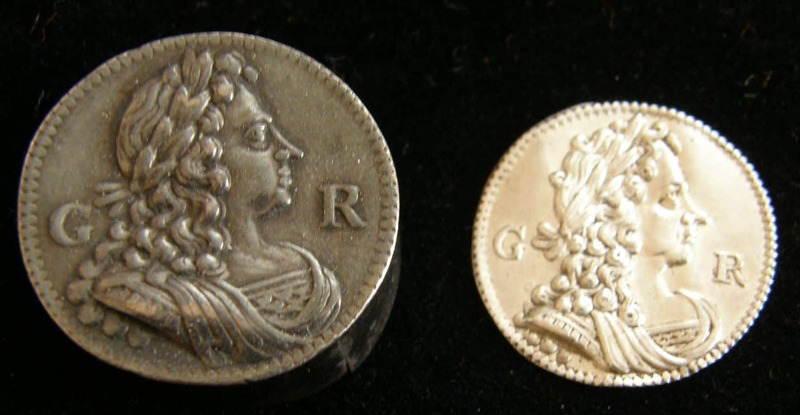 A revolutionary process at that time. 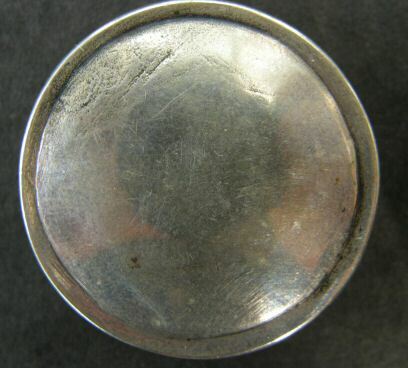 The condition is very good, one counter having some wear. 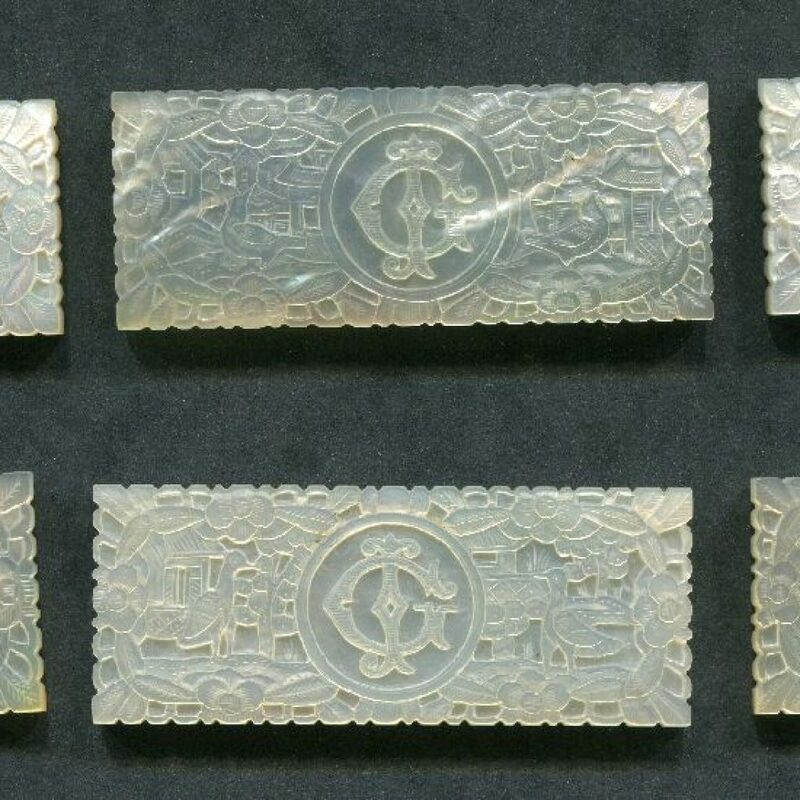 with matching deep carved MOP Pieces. 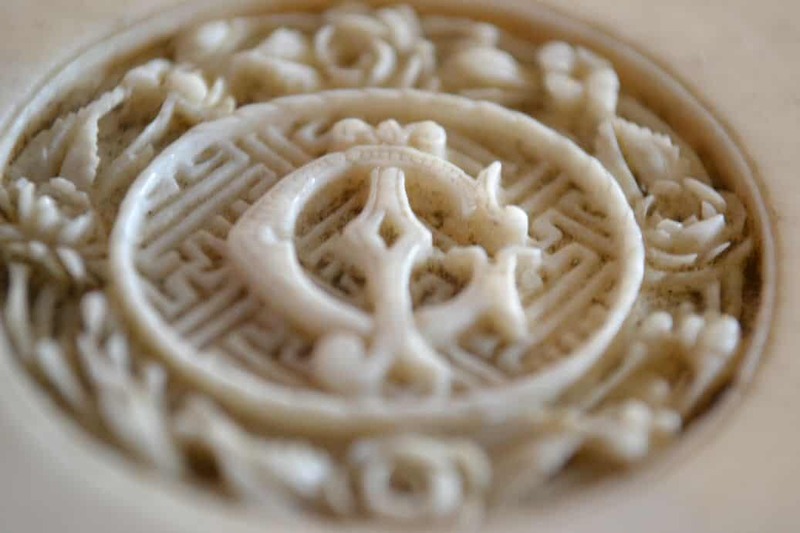 Made of African Ivory in the second half of the 19th century in Canton, China. 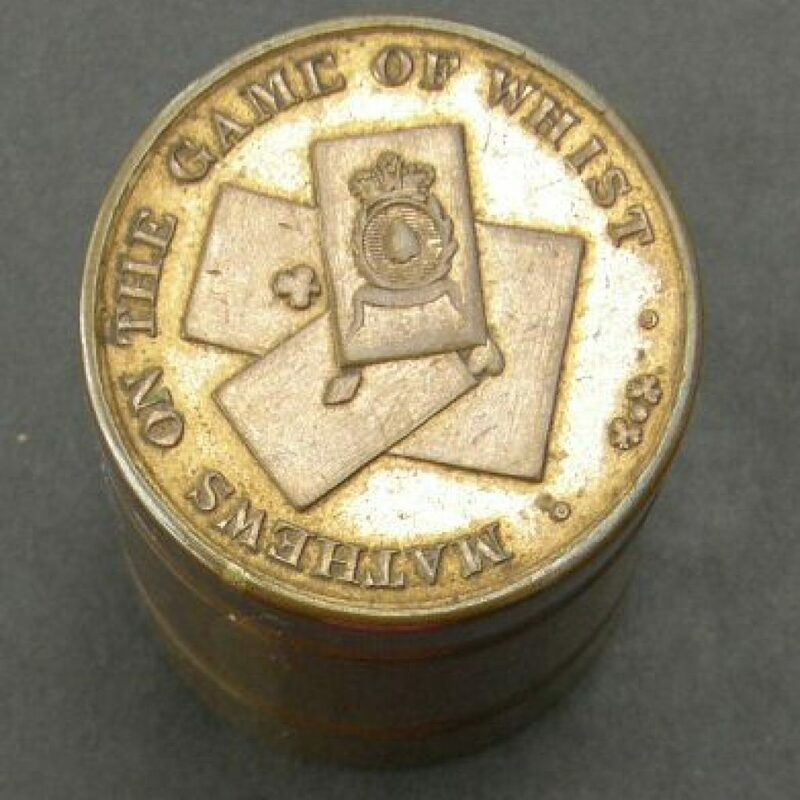 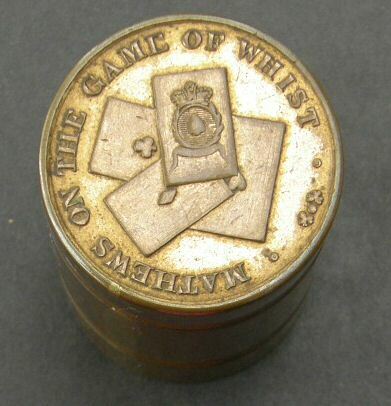 This box was made bespoke for a person with the initials JG or GJ and it primary purpose was for use in the game of Whist to score the tricks it alternative use was for gambling. 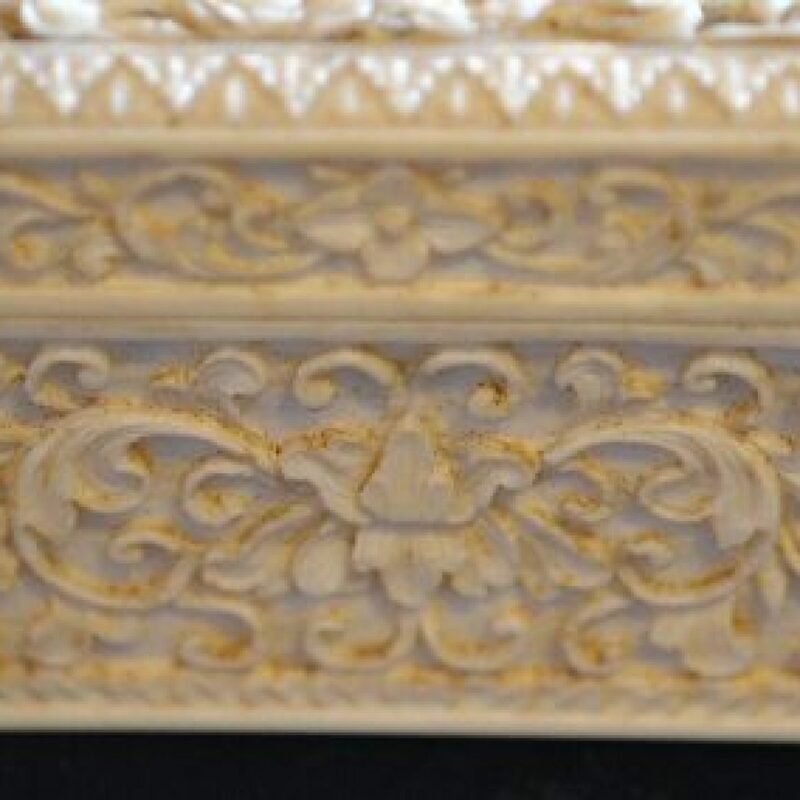 The box measures in millimeters 71.6-68.8-37.6 and is heavily decorated on all four sides with flowers and roses. 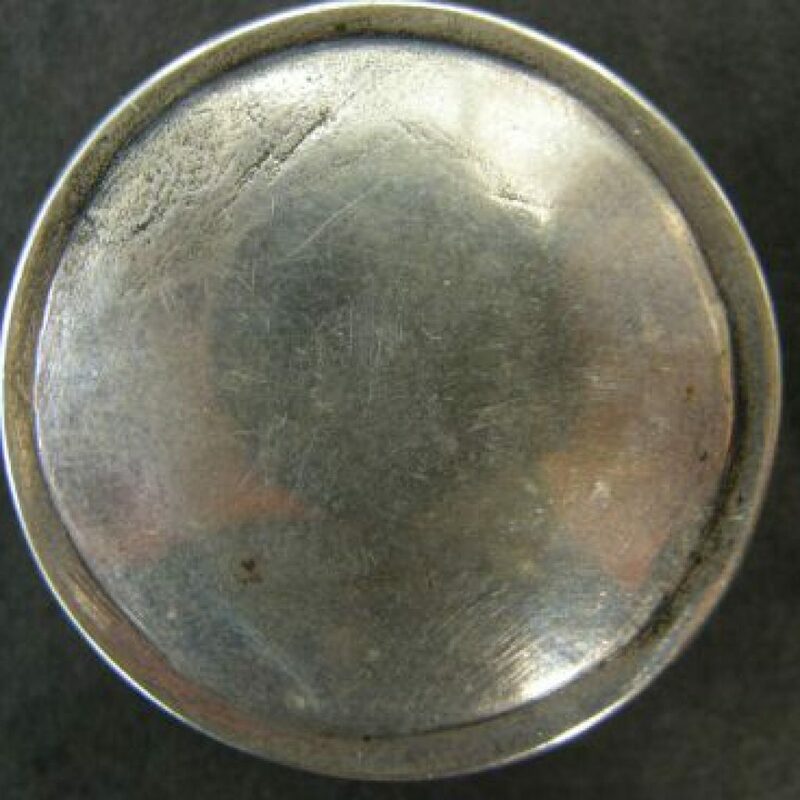 The base is plain. 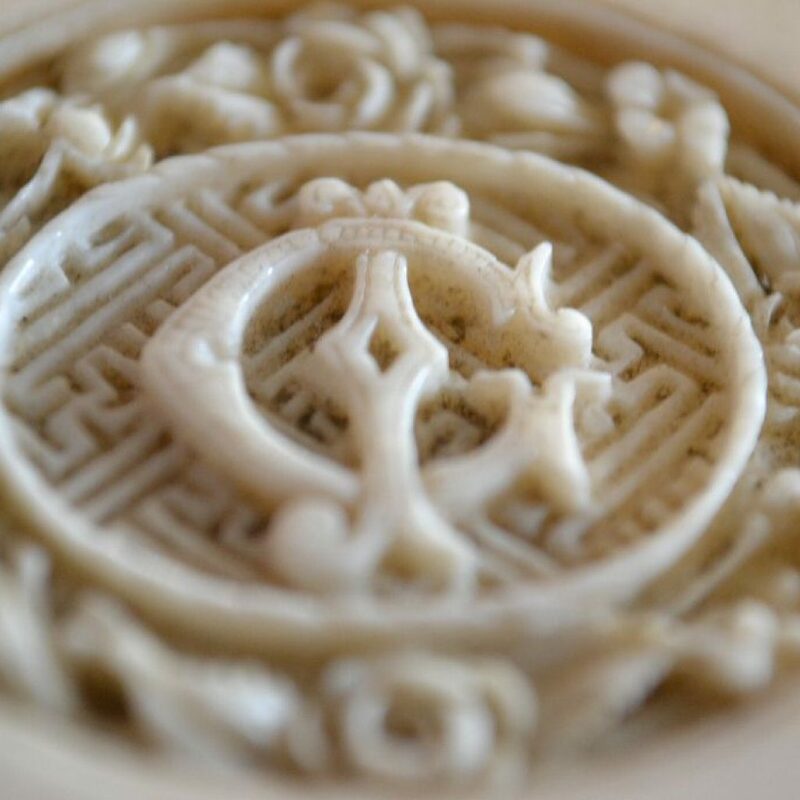 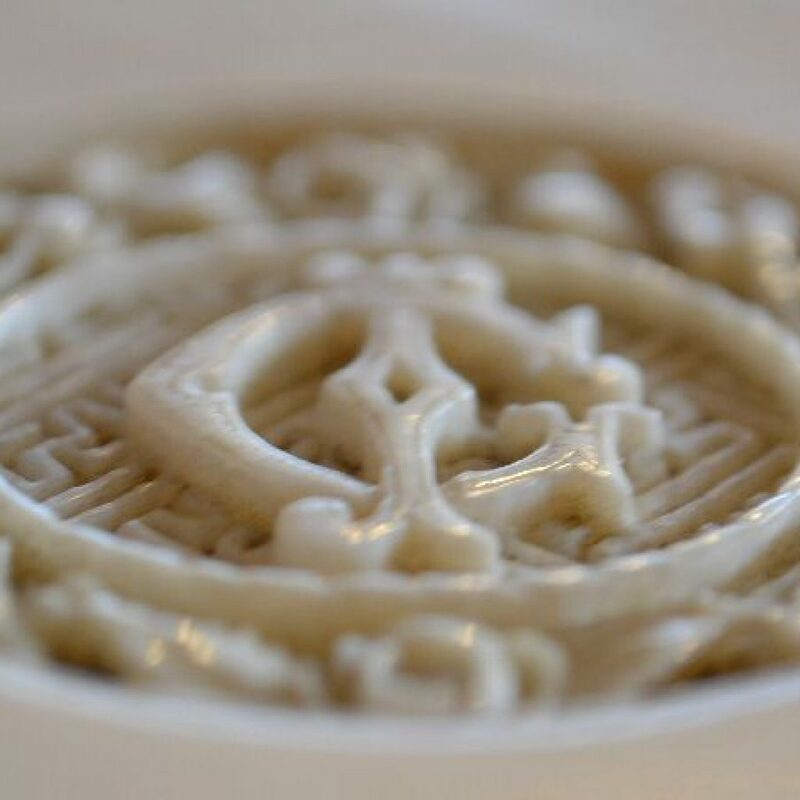 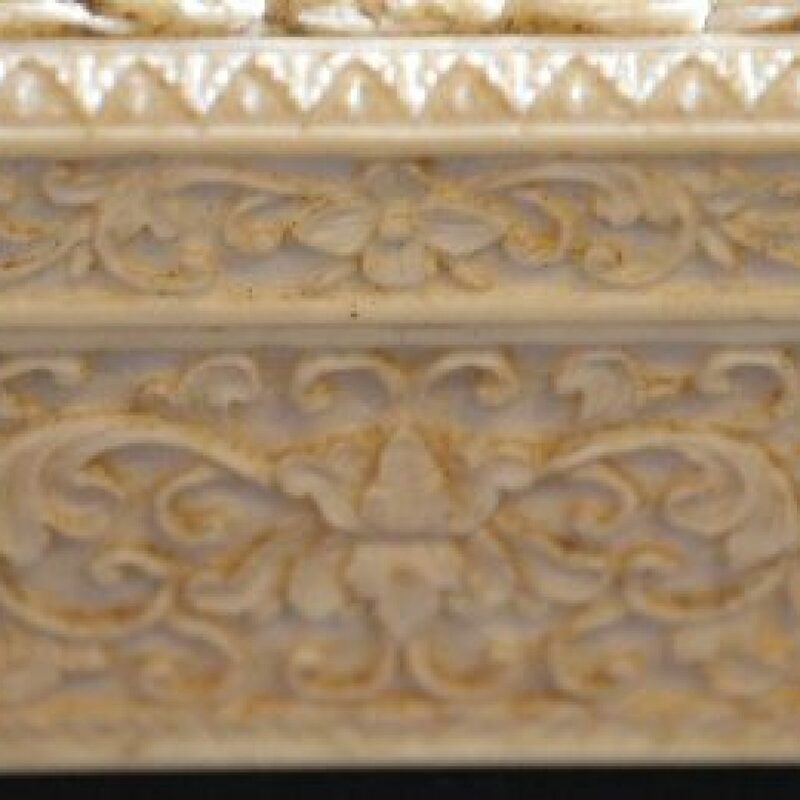 The top is again finely carved with a central area measuring in millimeters 46.3-43.6 supporting a cartouche of flowers with the initials JG carved against a background of lattice work. 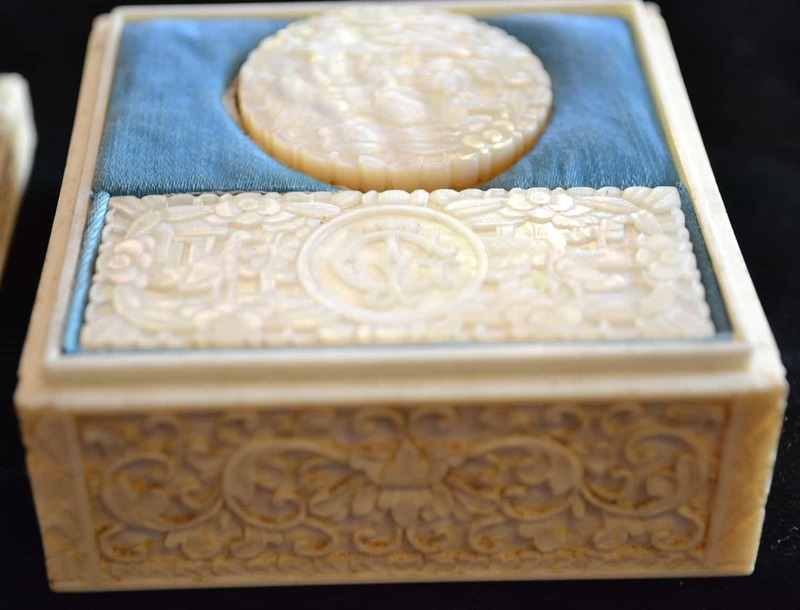 The interior has two partitions each lined with blue brocade. These partitions house Eight circular and Six oblong Mother of Pearl gaming counters. 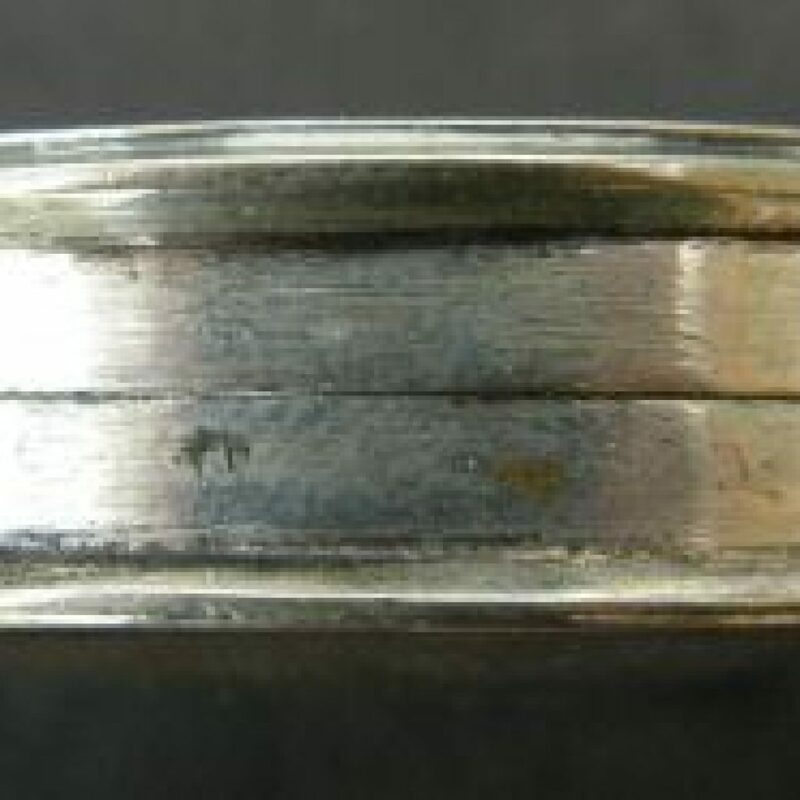 The circular counters measure 34.6 by 3.14mm and the oblong 57.4 by 23 by 2.9mm. 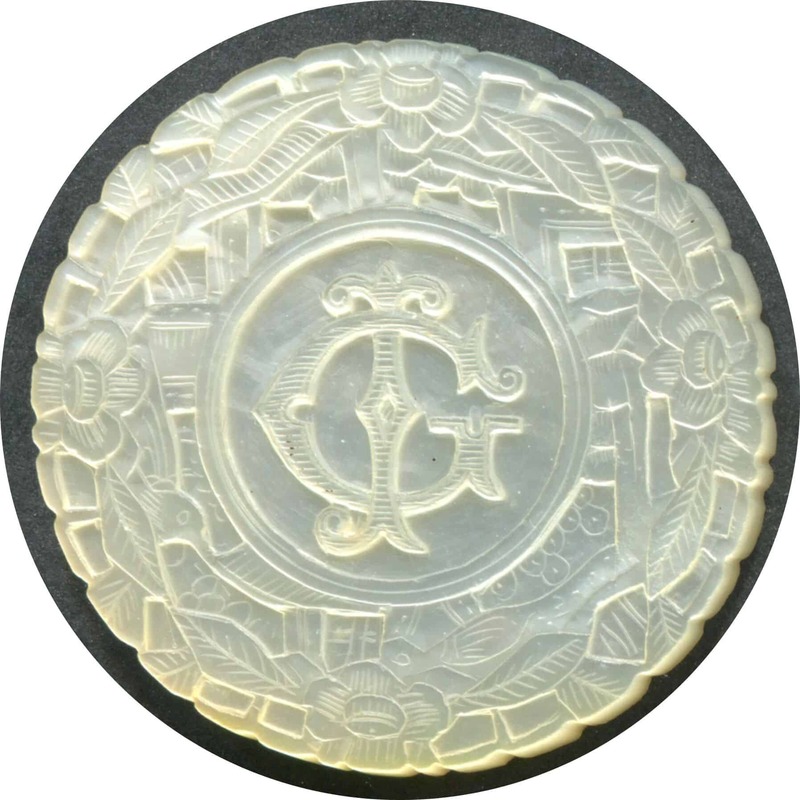 Each counter is deep carved with a central cartouche with matching JG/GJ initials: the background and reverse of each counter reflecting a scene from Village Life – Unusually birds appear on the counters. 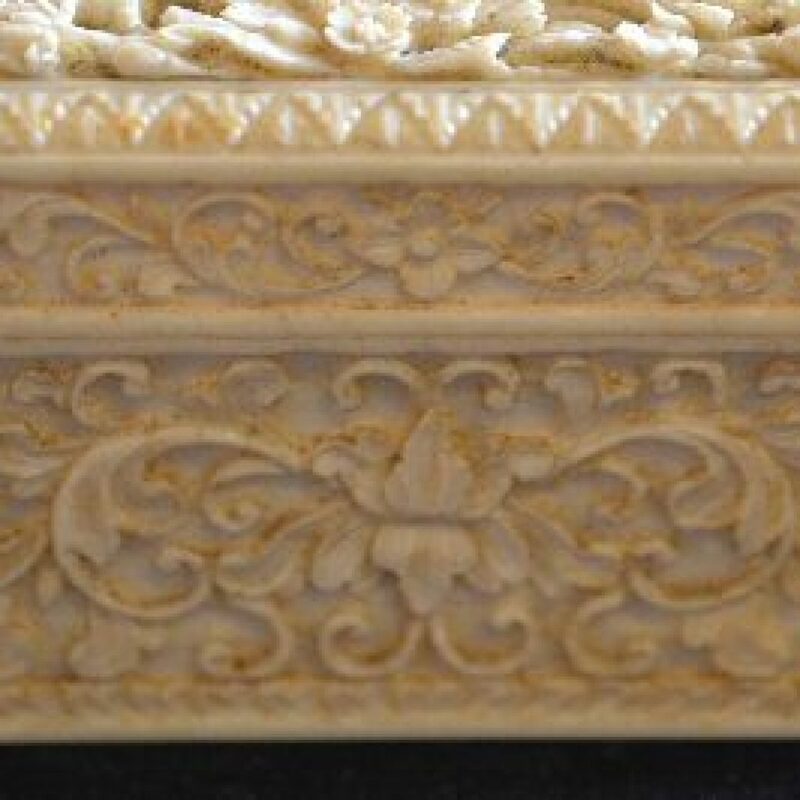 The condition throughout is very good with normal yellowing of the ivory as is usual with age, the interior brocade is also in very good condition. 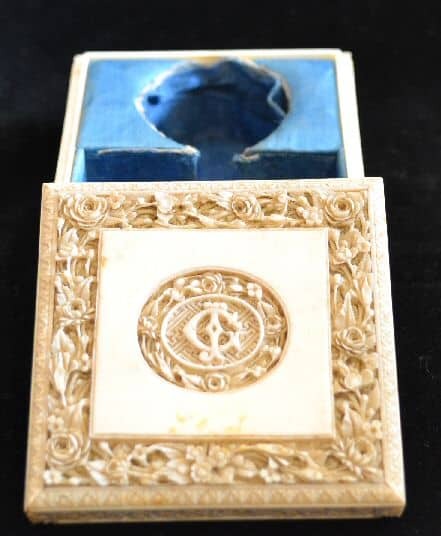 Complete Initialed Deep Carved Counter boxes being very scarce. 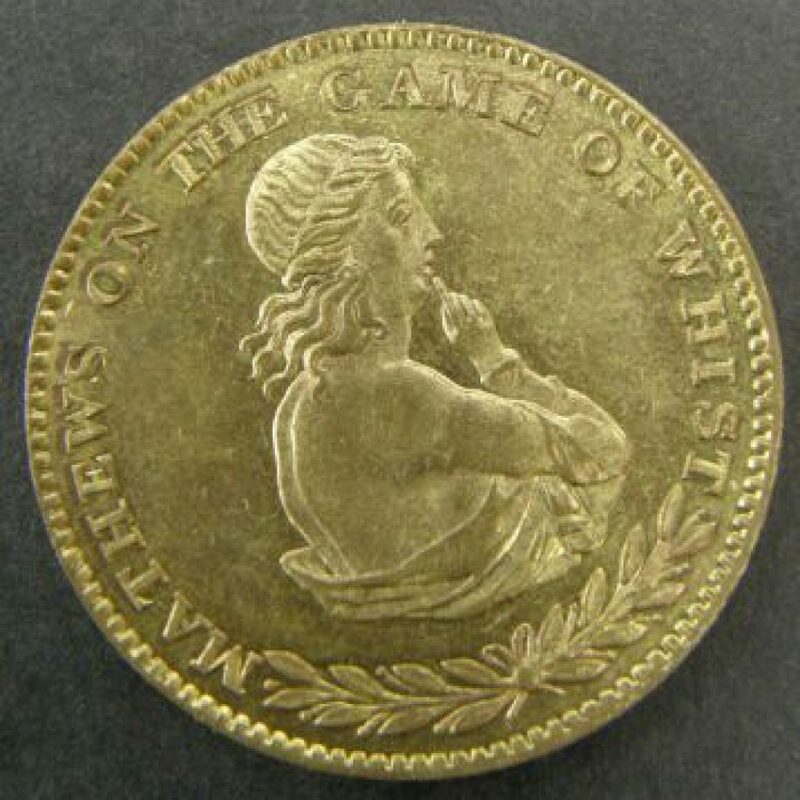 We are prohibited in send this outside the EU unless you have the appropriate CITES Certificate. 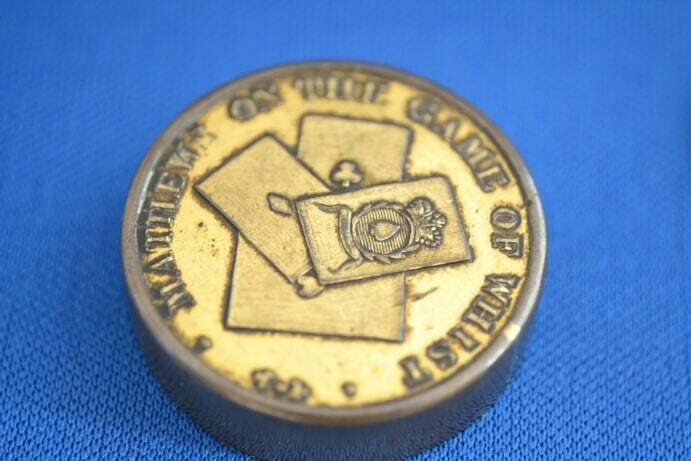 on one side and with playing cards on the other. 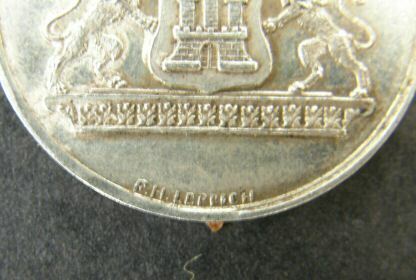 Each counter is ‘signed’ “F.H.Leppich”.